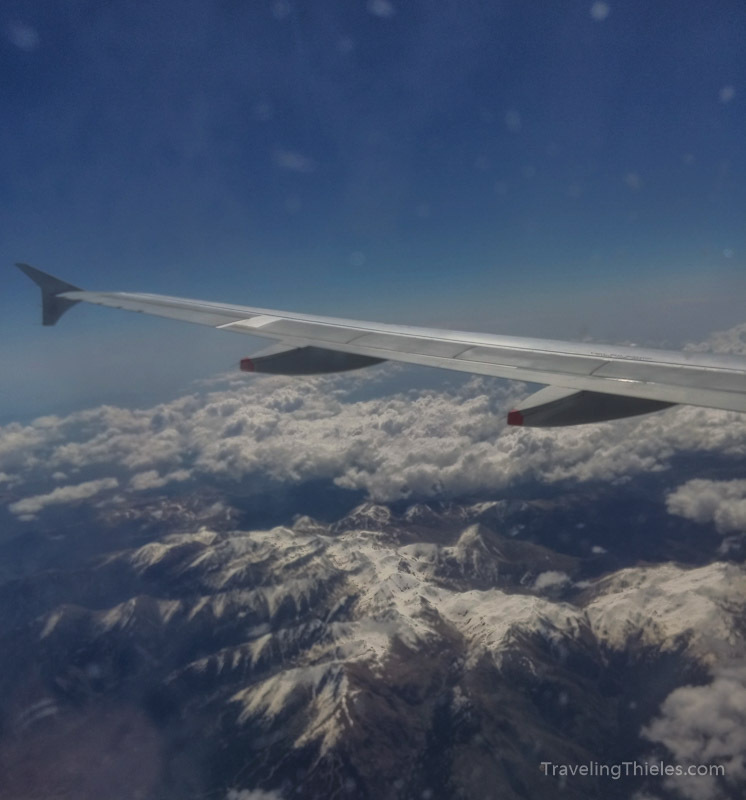 Our flight into Barcelona was from London. 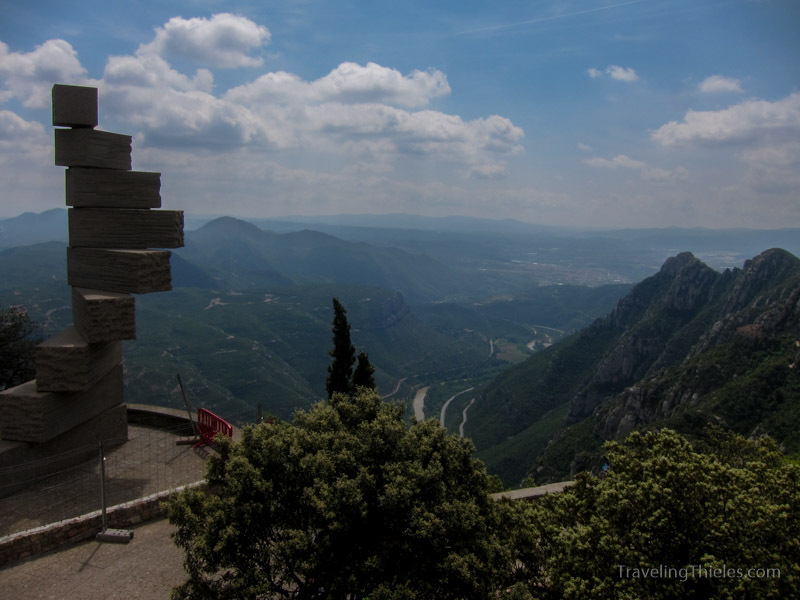 We got a great view of the Pyrennes mountains coming into the city. 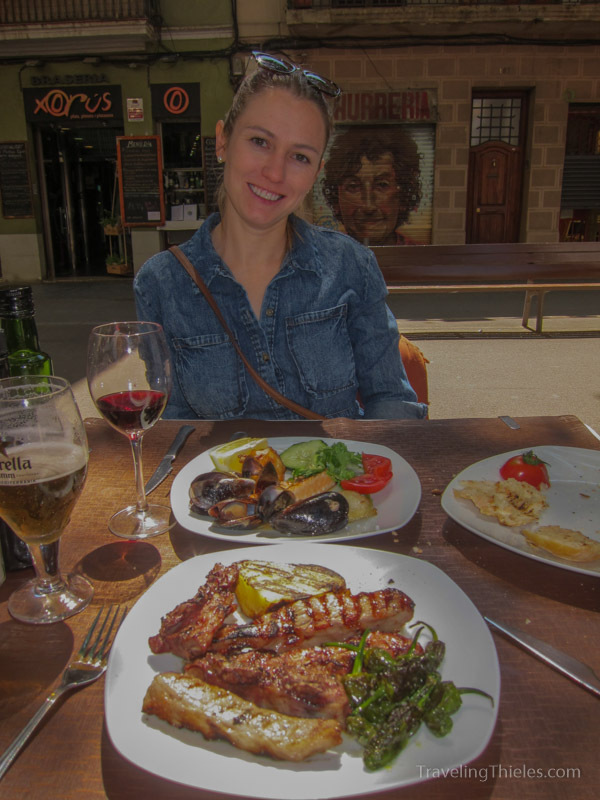 First meal in Barcelona was on the Rambla de Poble Nou. This was a new street for me and had a great local feel to it. 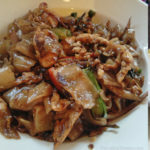 Not too crowded with good food at reasonable prices. 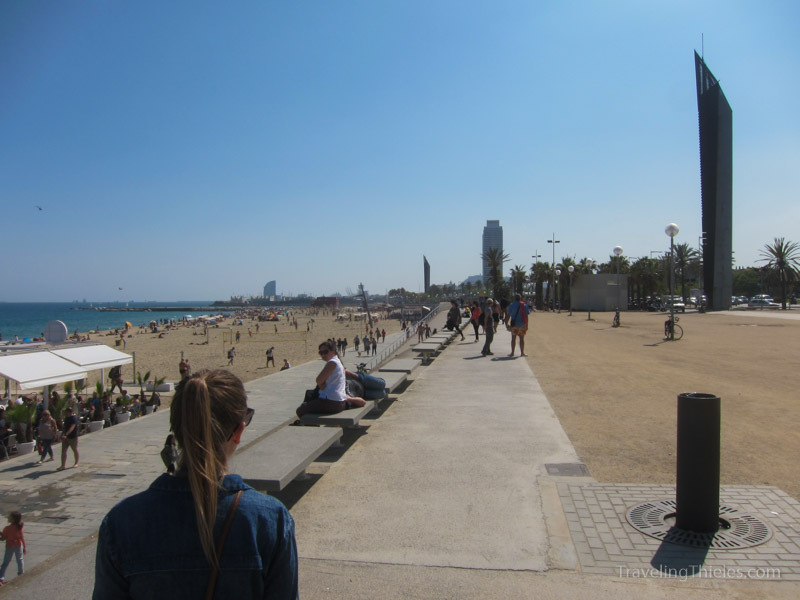 The beaches in Barcelona near Poble Nou and olympic park. We enjoyed watching some serious volleyball competition. 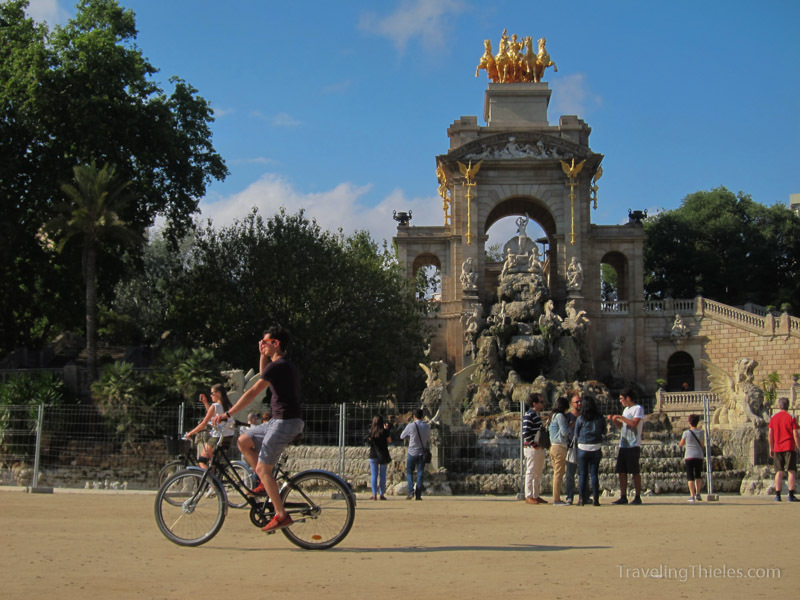 Water feature in the parc de la ciutadella. 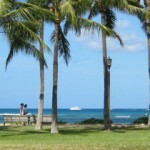 It was beautiful weather during our stay – warm in the sun and cool in shade every day. Arc de Triumph on one of our walkabout days (we covered some serious ground – probably 10 miles a day for the first couple days). 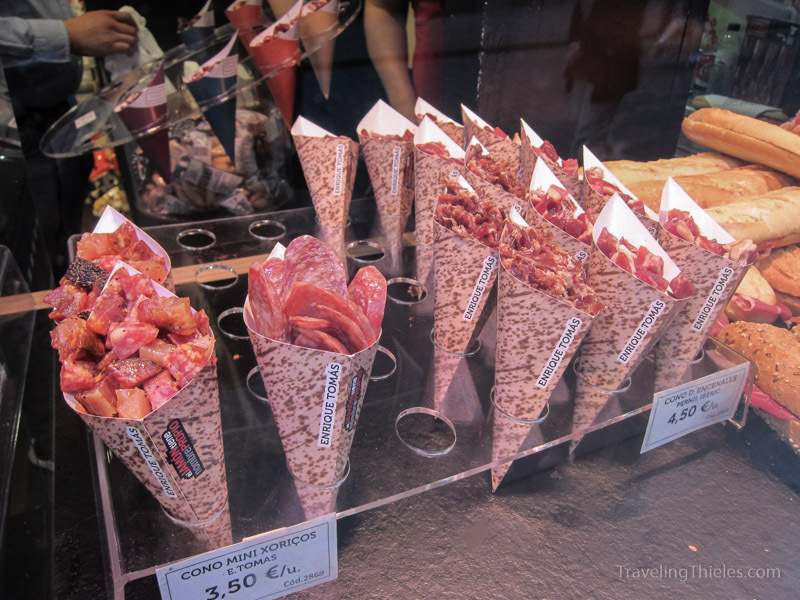 We discovered these jamon cornettes which were wonderful cheap snacks. Our favorite were the serrano chunks. We also got this bad boy with mixed pieces from the various pork products sold. 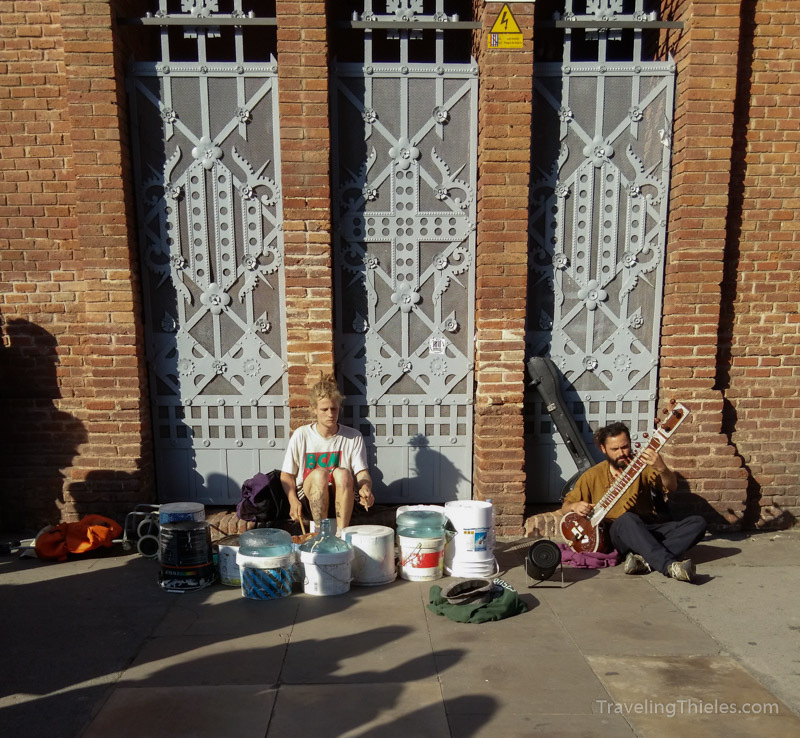 Some street musicians at the Arc de Triumph. Neat combo of sitar player and drummer. 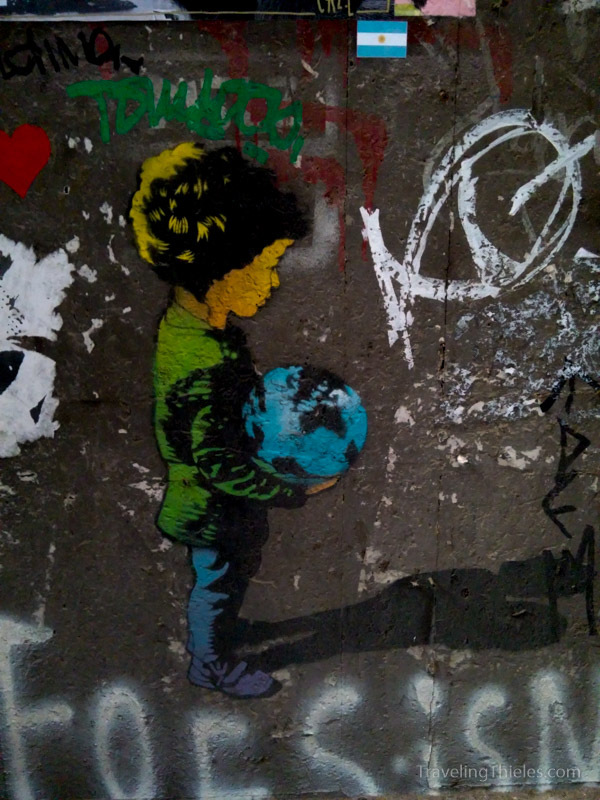 Europe has been in the news lately with the refugees fleeing from Syria and the middle east. 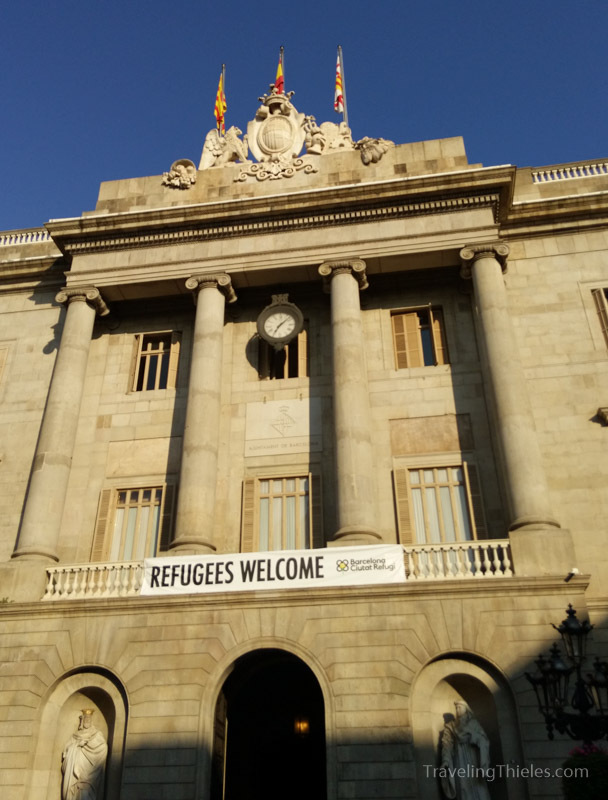 Both Barcelona and Madrid capitals made it clear for tourists that they were willing to accept those fleeing. We found these bubble guys in a few places and it seems like a product that could be sold online. 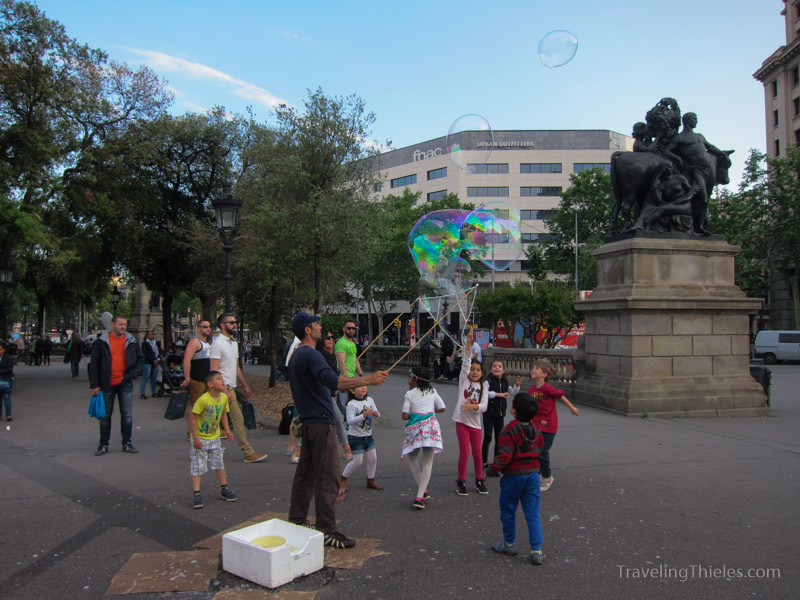 The kids loved the giant bubbles created by a simple setup with two ropes in between two sticks. 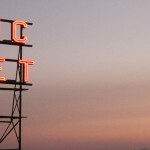 If I was trying to get money off tourists this is what I would do. Another bubble guy. Some were better than others due to technique or the tools they were using. We watched for quite a bit to figure it all out. 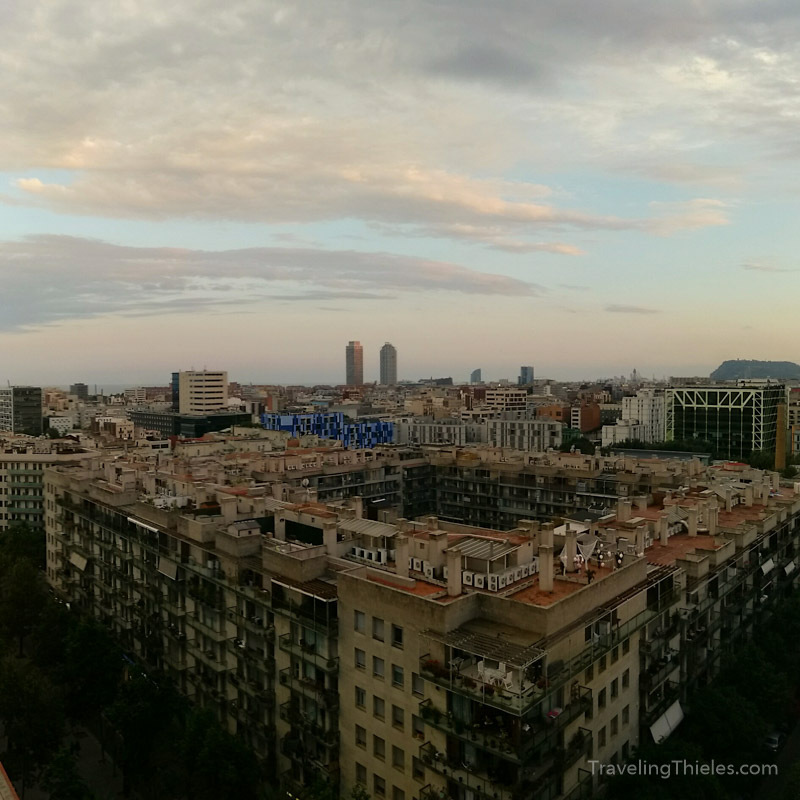 This was the view of Barcelona from our hotel room in the Four Points Sheraton Diagonal. 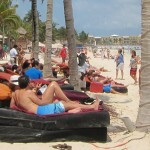 It was a newer hotel which was nice and only 4k Starwood points per night. 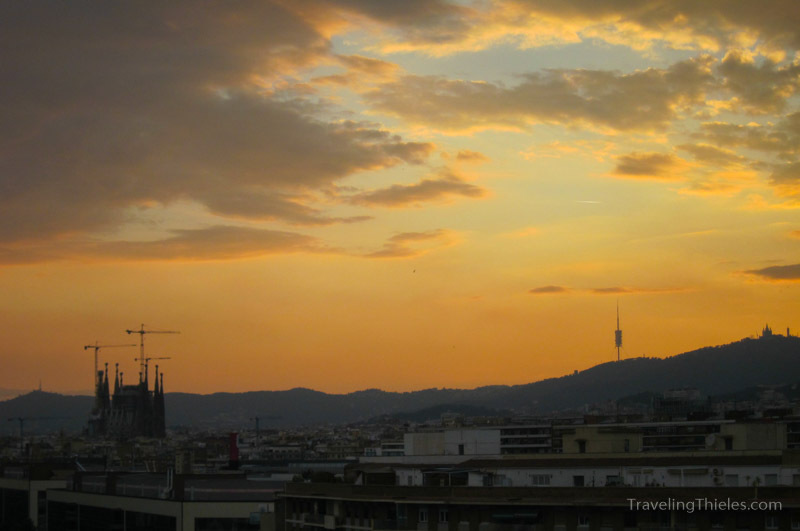 Almost every night we enjoyed a great sunset around 9 pm including the Sagrada Familia under construction and the hill of Parc de Cassaroles in the background. 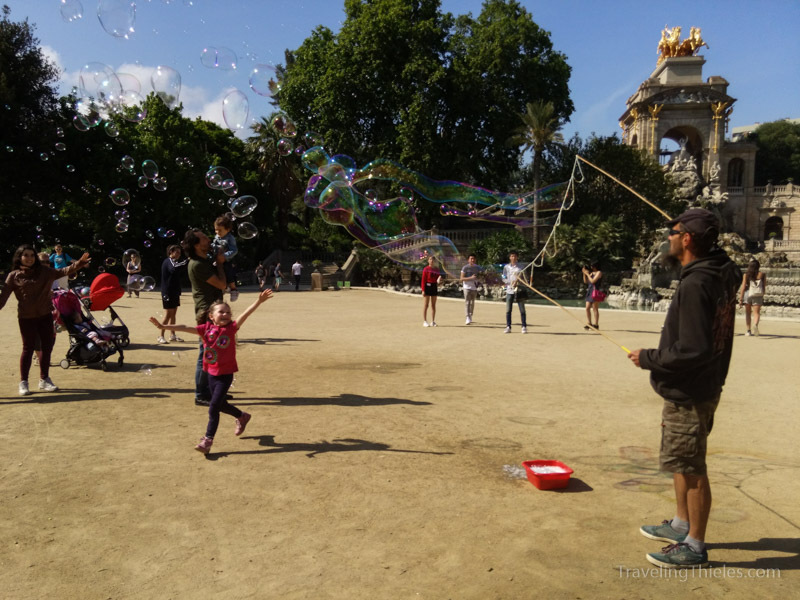 Plaza de Catalunya in Barcelona. 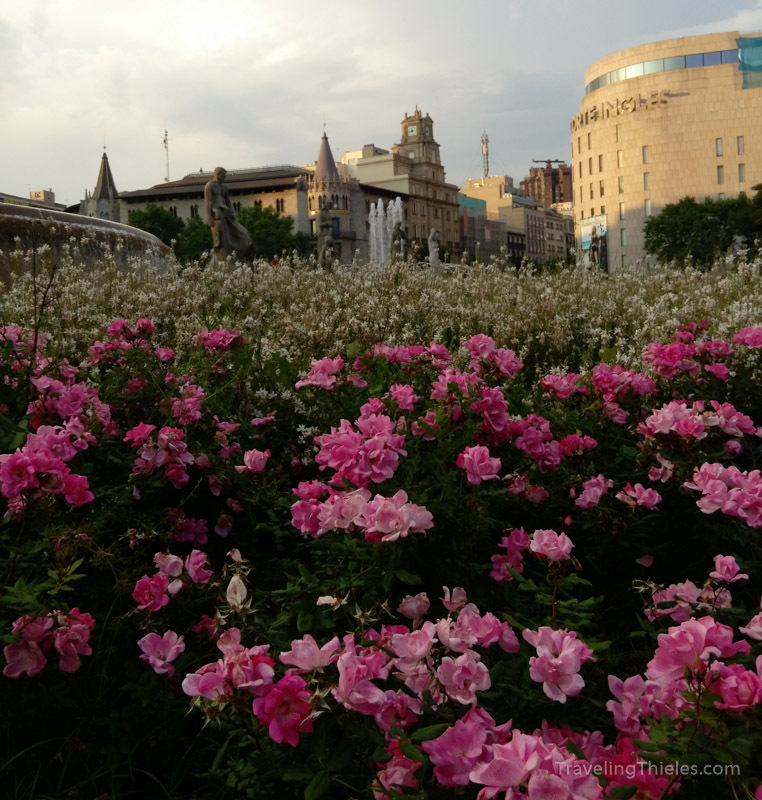 Great flowers. The other side of our view from the hotel in Barcelona. In the part of the city expanded during the 1800s, each city block has a center square accessible to the residents, you can kinda see in this photo. 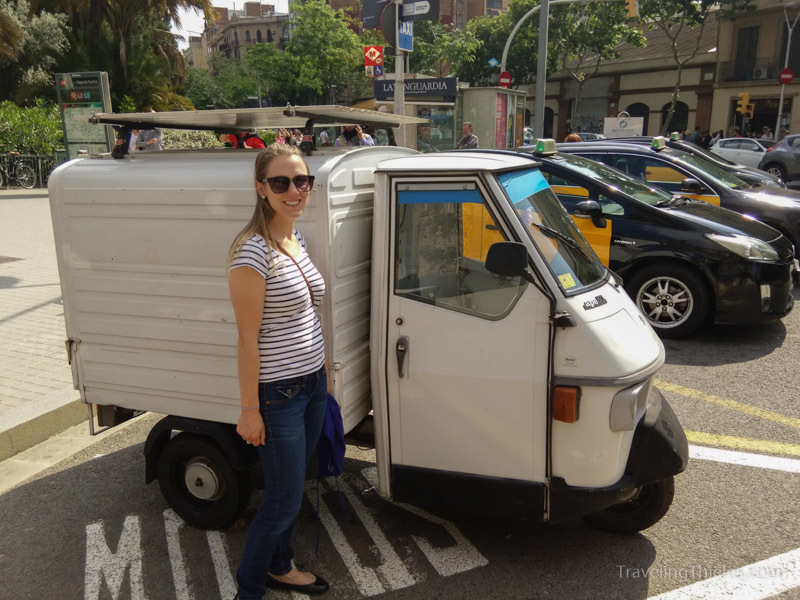 Elisa found a pint-sized truck perfect for her. 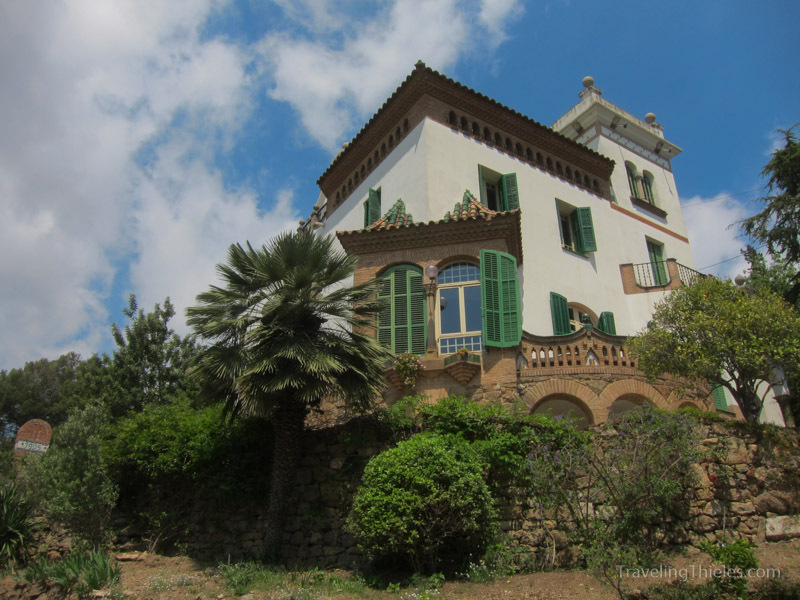 We hiked up to the Parc Guell and saw the house that Gaudi created for the original owners of the house. 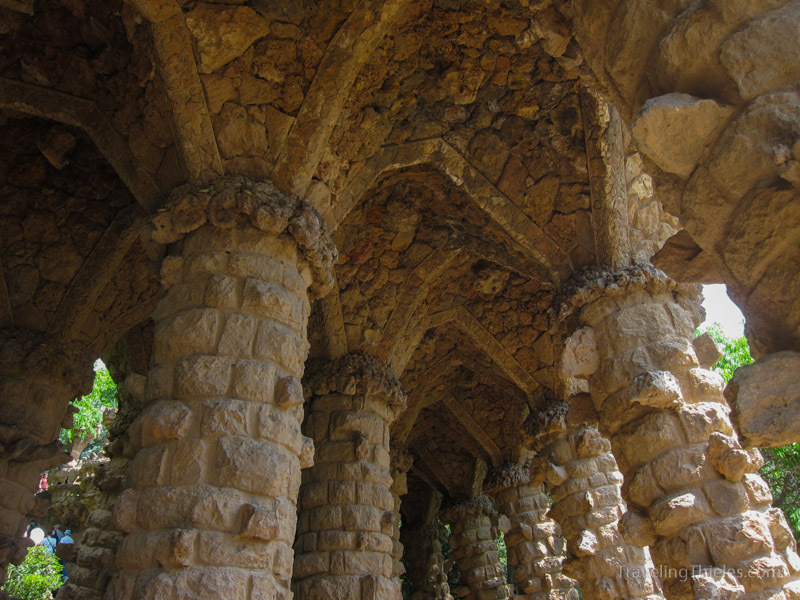 Aqueducts or bridges in Parc Guell. Beneath each one was a musician playing. 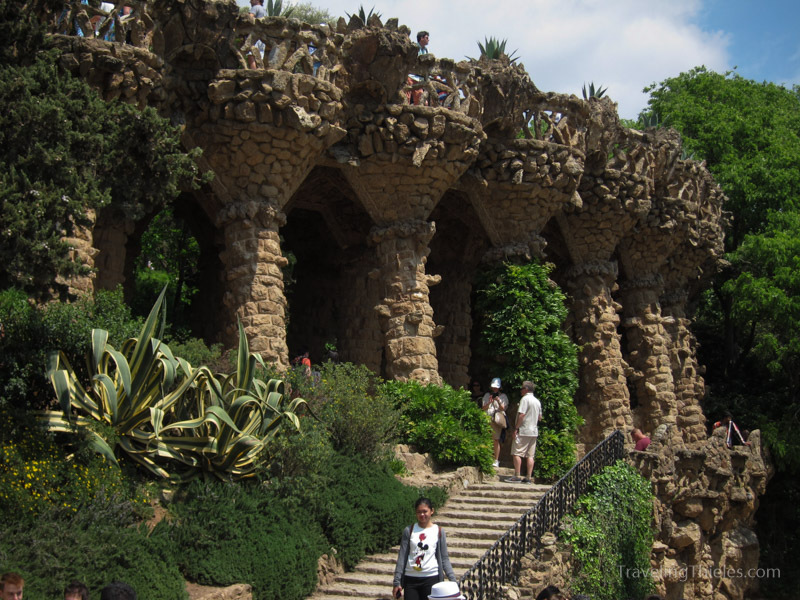 Close up view of the bridges in Parc Guell. 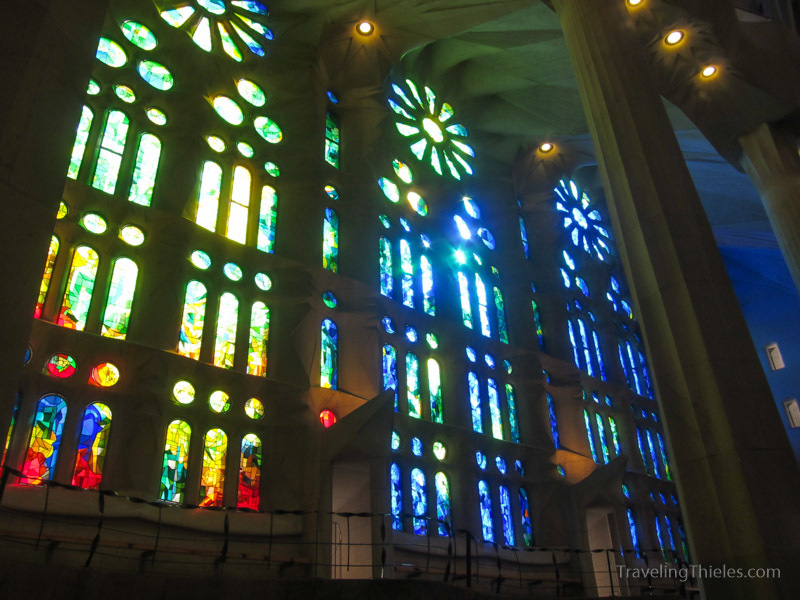 Gaudi was inspired by nature in his works and these look like rock crystals. Elisa underneath the rock bridge. 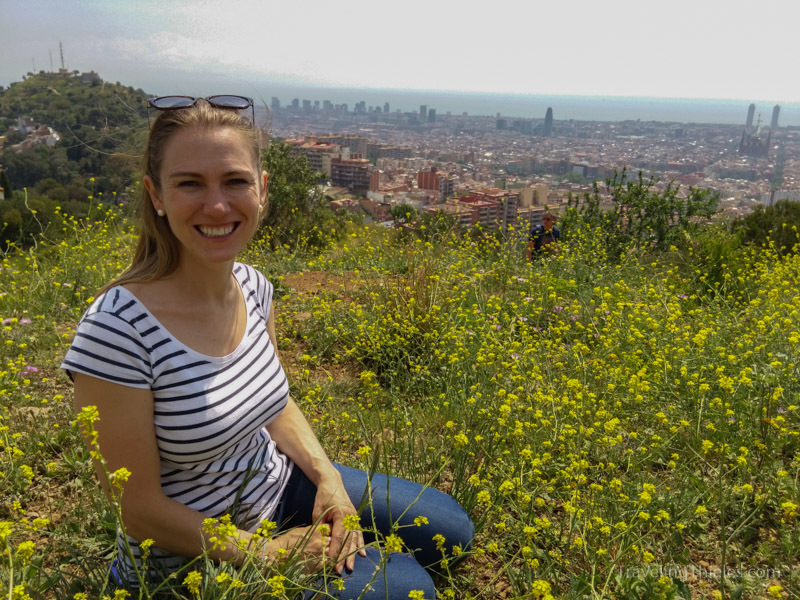 In the rear of Parc Guell is a tall hill with a dirt trail to the top. 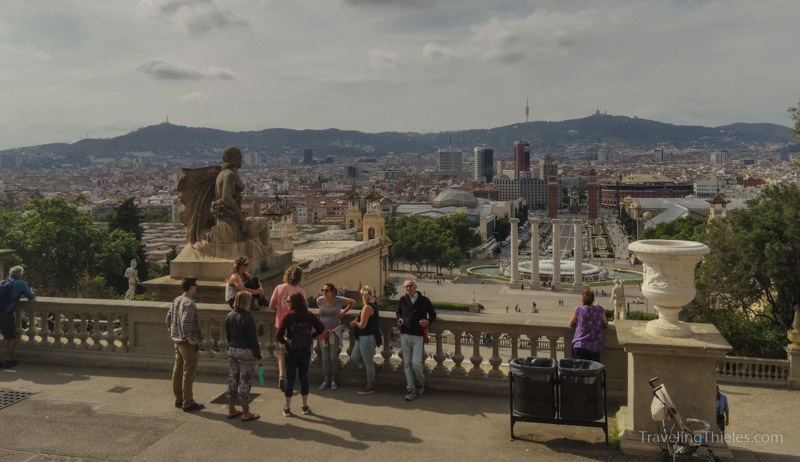 This is one of our favorite spots in the city as it has a 360 degree view and there are very few other tourists to obstruct it. 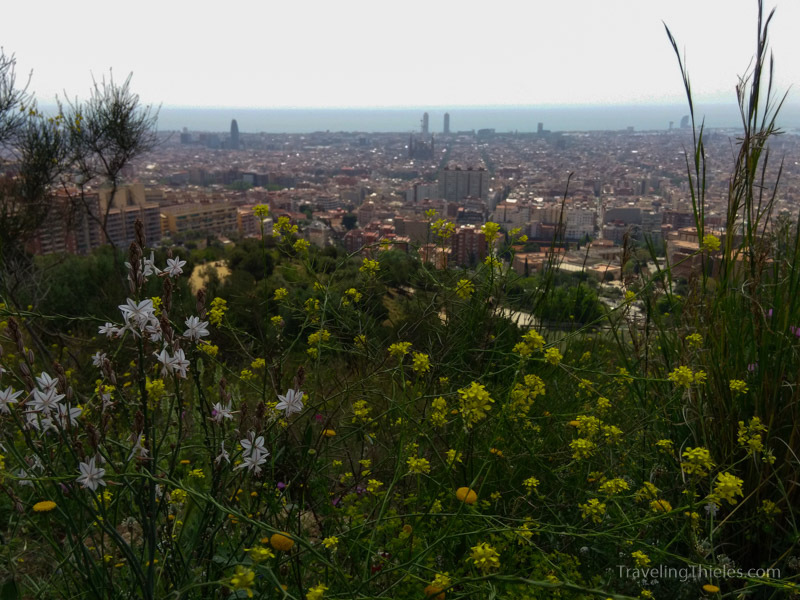 The hill above Parc Guell was covered with beautiful wildflowers, which we found more of later in our Spain trip. 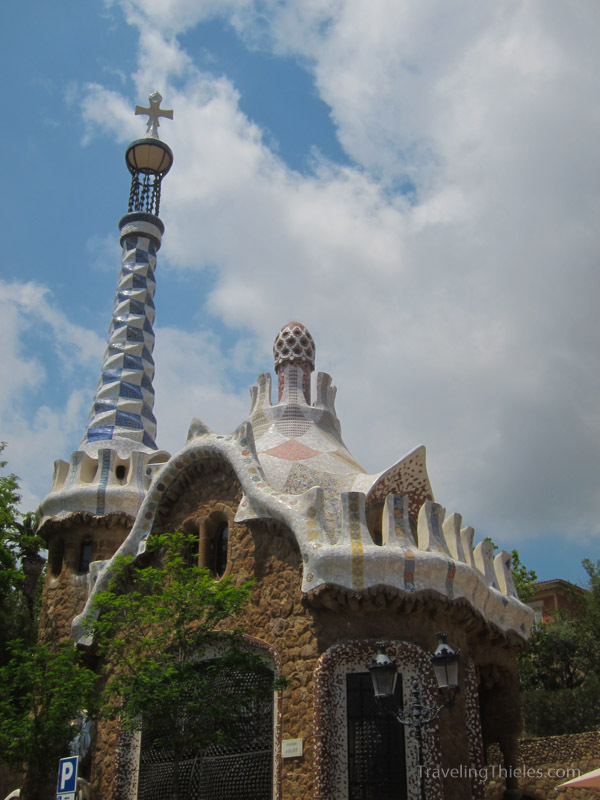 Gaudi creation in Parc Guell reminiscent of the sugar plum fairy house. 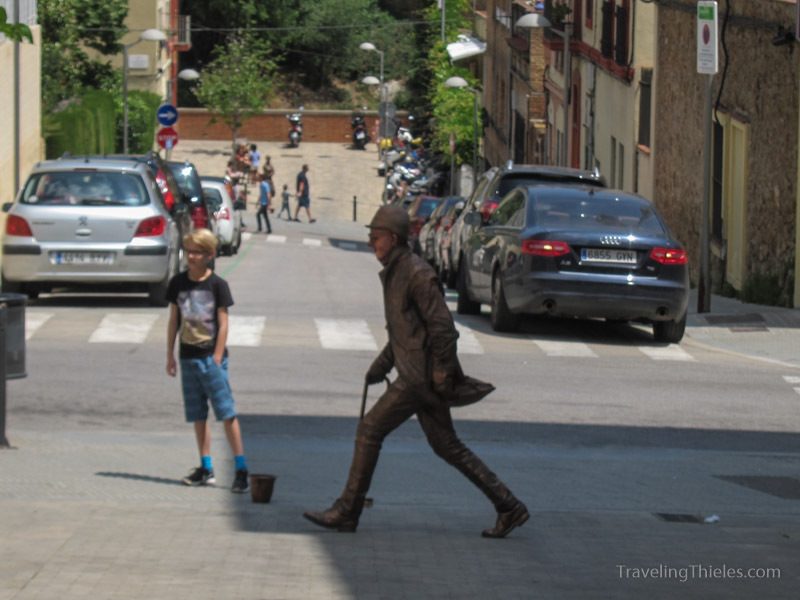 Barcelona has some great street artists and statue people. This one was particularly impressive – I literally almost walked up to him to see how the sculpture was done so detailed. 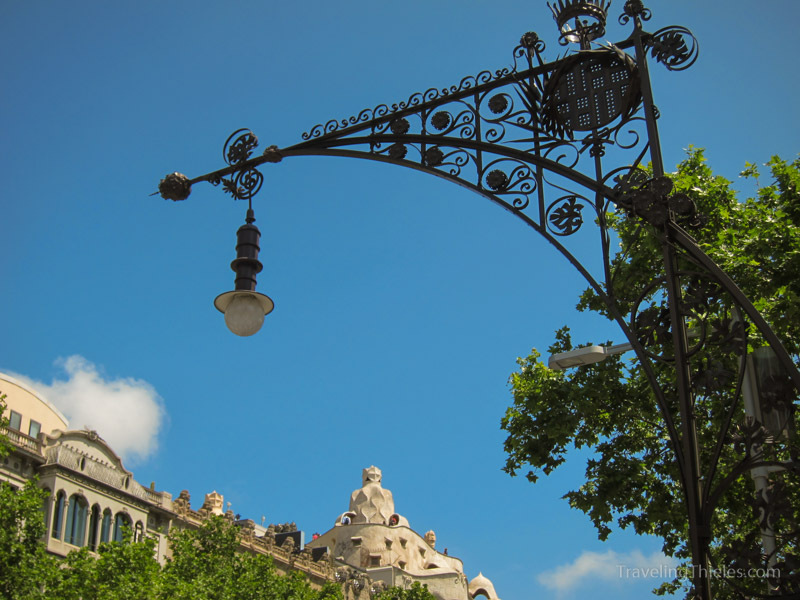 Modernisme architecture style (epitomized by the works of Catalan architect Antoni Gaudi) permeates the Barcelona streets – here in the streetlamps lining the Passeig de Gracia. 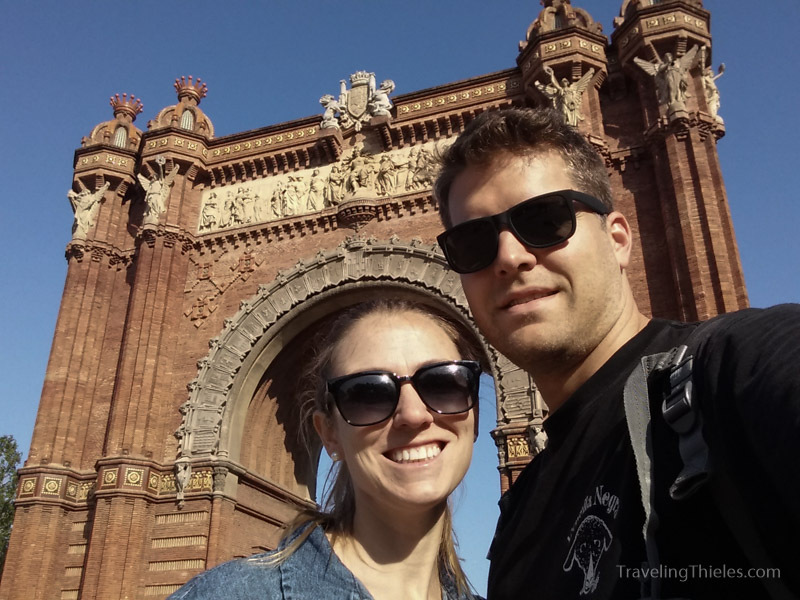 We skipped a number of museums and sites since the lines and prices were a bit ridiculous. 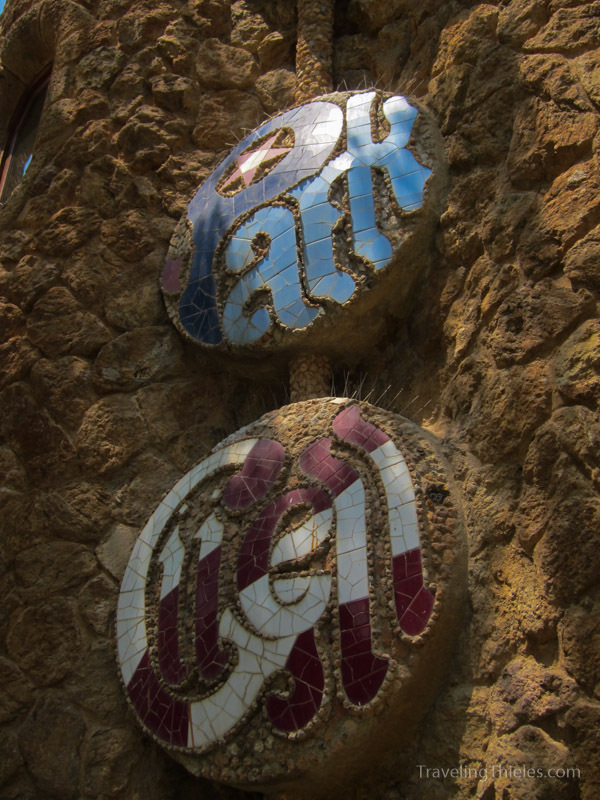 We did visit the casa de Amatller however, which was fantastic for the stained glass windows and Art Nouveau stylings. 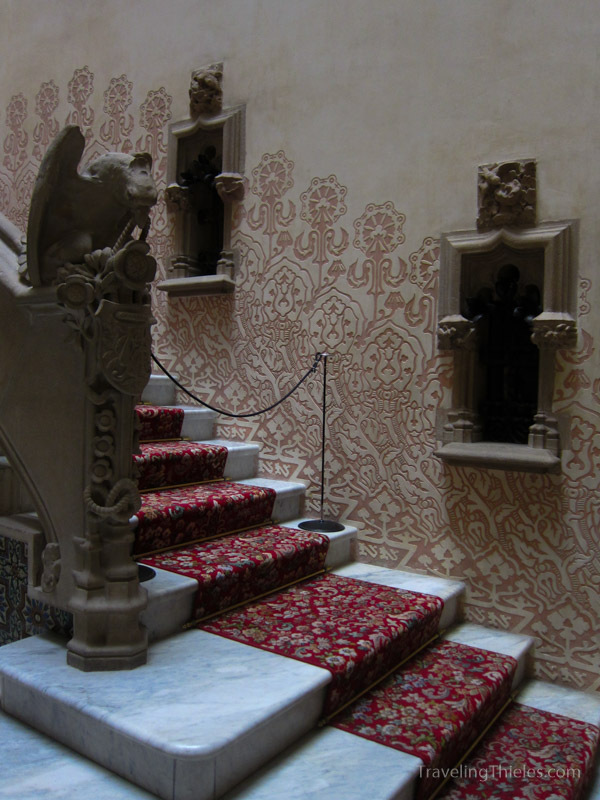 This is the inner, central staircase of the house. 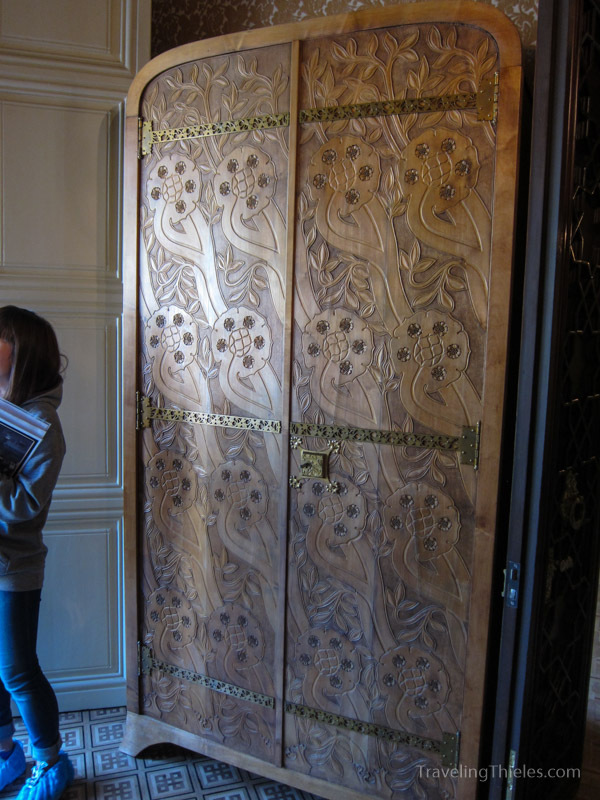 Art Nouveau style doors carved in the house. 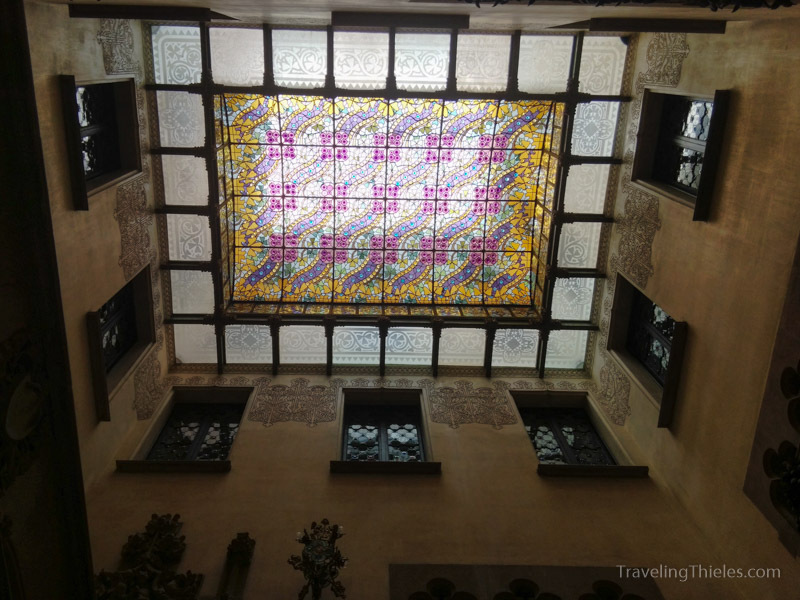 Beautiful stained-glass skylight in the house. 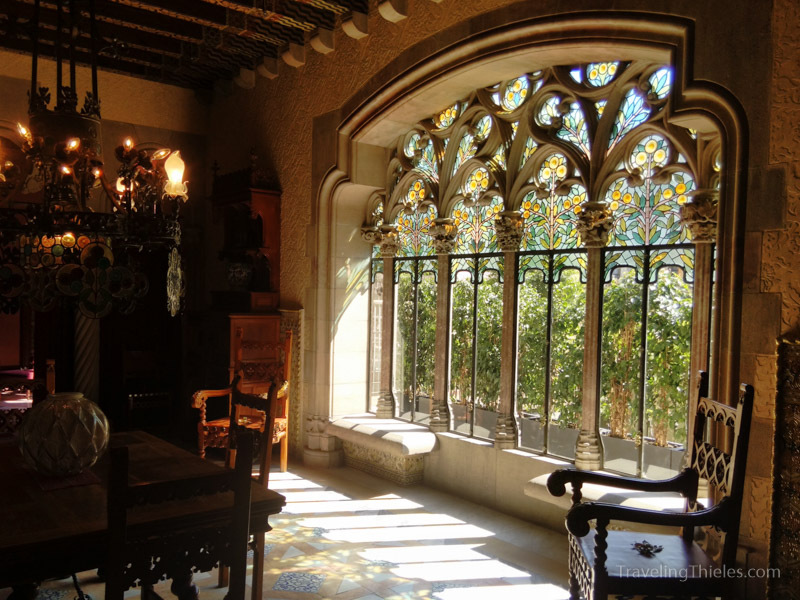 Dining room of the Casa Amatller. 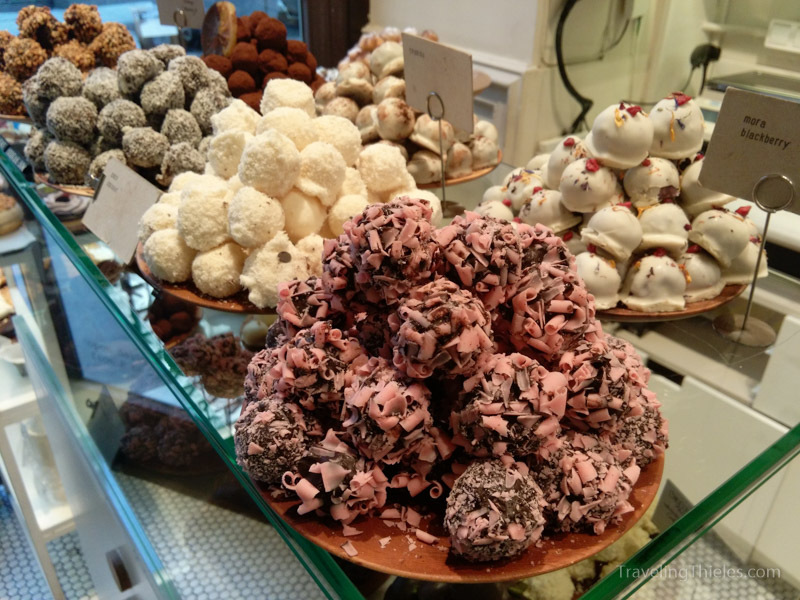 The house was created 150 years ago by a chocolate baron. A foundation setup by the family still owns it and fittingly there is a chocolate shop in the ground level of the house. 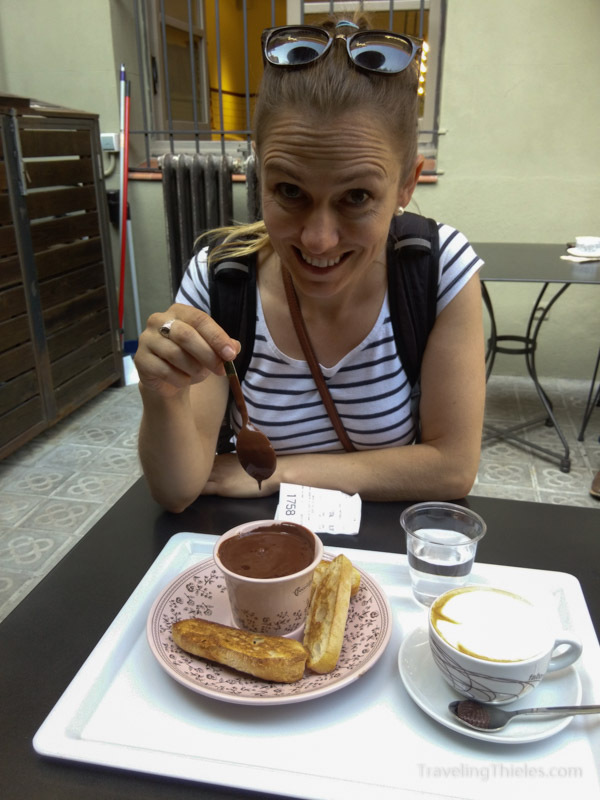 Elisa got her first taste of european hot chocolate there and loved it. 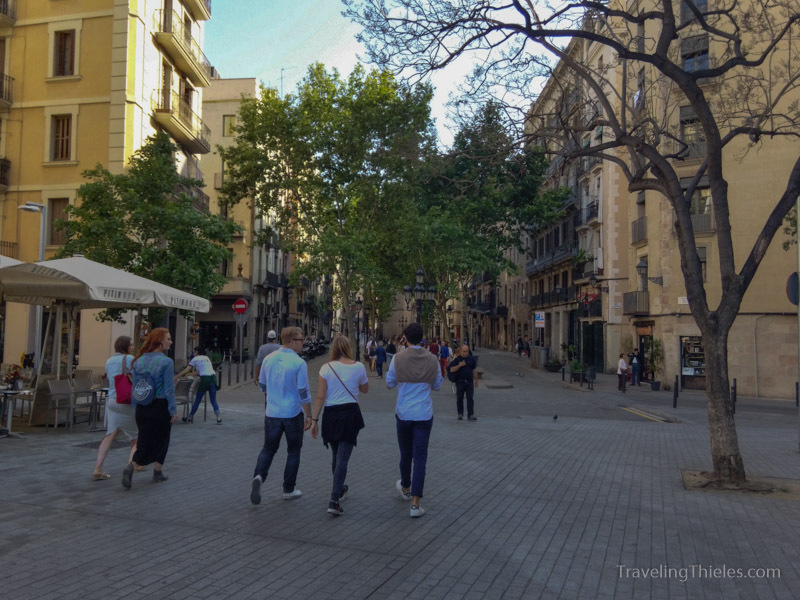 La Rambla de Catalunya in Barcelona is one of Europe’s classic streets. Just watch where your wallet is! 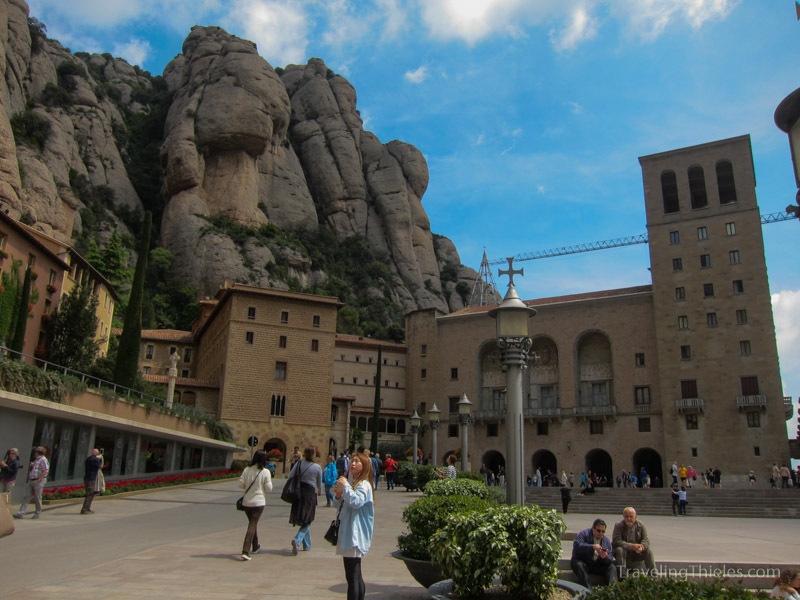 For the cat lovers in the family..
We took a wonderful day-trip to Montserrat about an hour NW of Barcelona. It was Mayne’s fifth time there but it never gets old. We got to see the boys choir perform (which sounded nice but somewhat of a zoo with thousands of tourists holding their cameras in the air for a video of the sight). 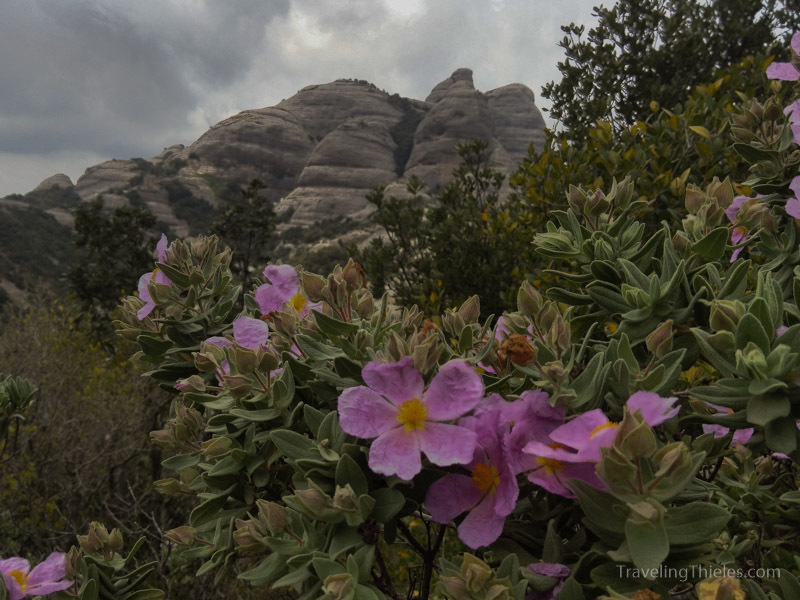 On our hike around Montserrat. It was a little more exhausting than I remember from 10 years ago! 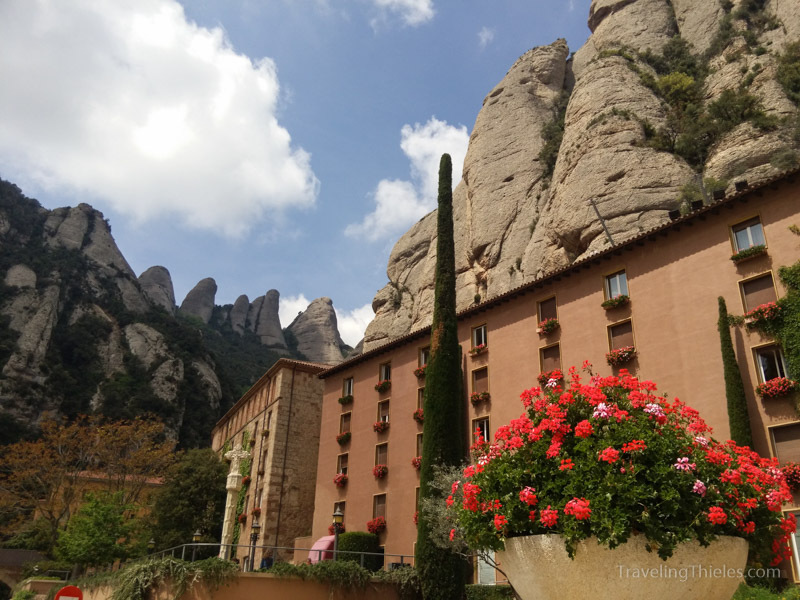 Looking at the holy mountain spires from the Monastery. 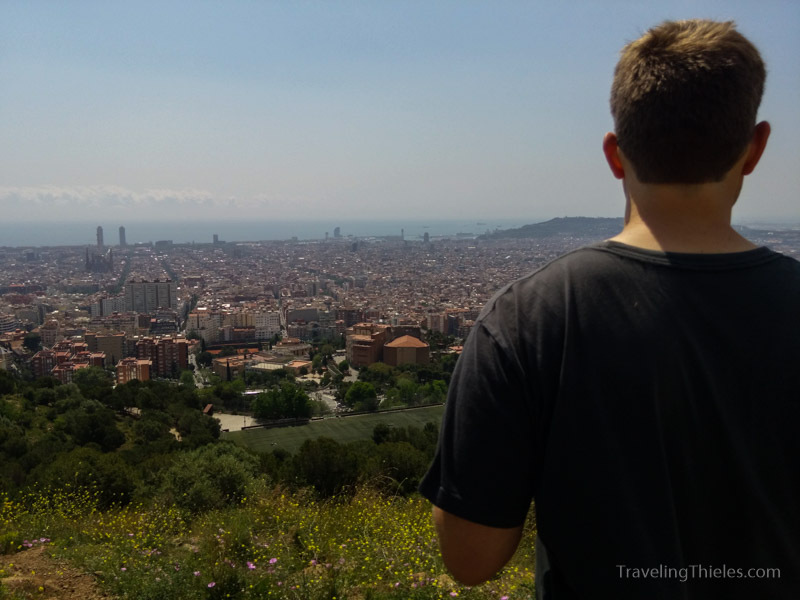 Looking at the MNAC – a big art museum which we declined visiting but did hike to the top of for some views over Barcelona. 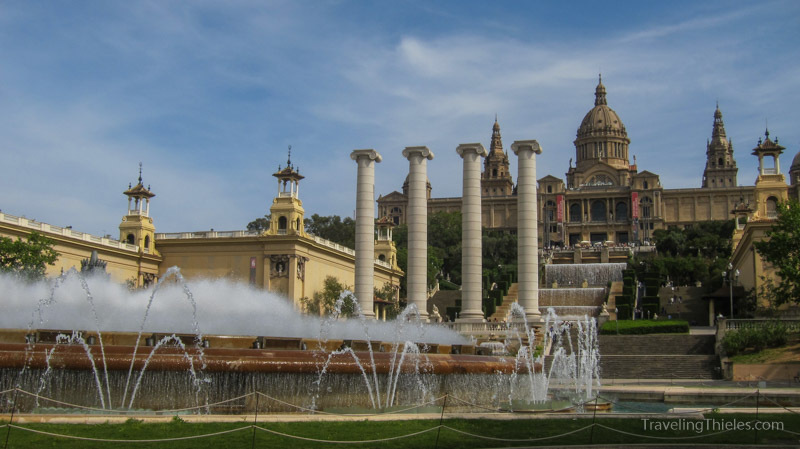 View from top of the waterfalls in from of the MNAC museum. 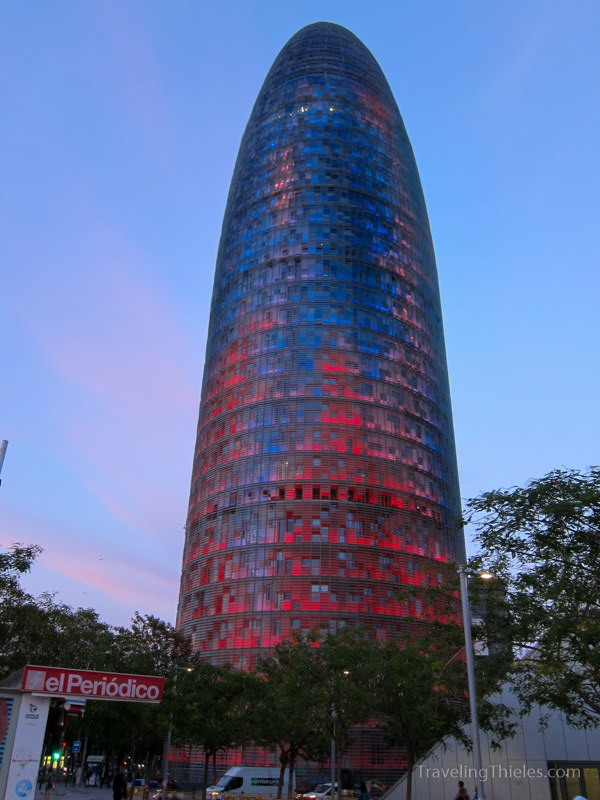 They were building this tower when Mayne was in Barcelona in 2006. It’s now finished and pretty neat. 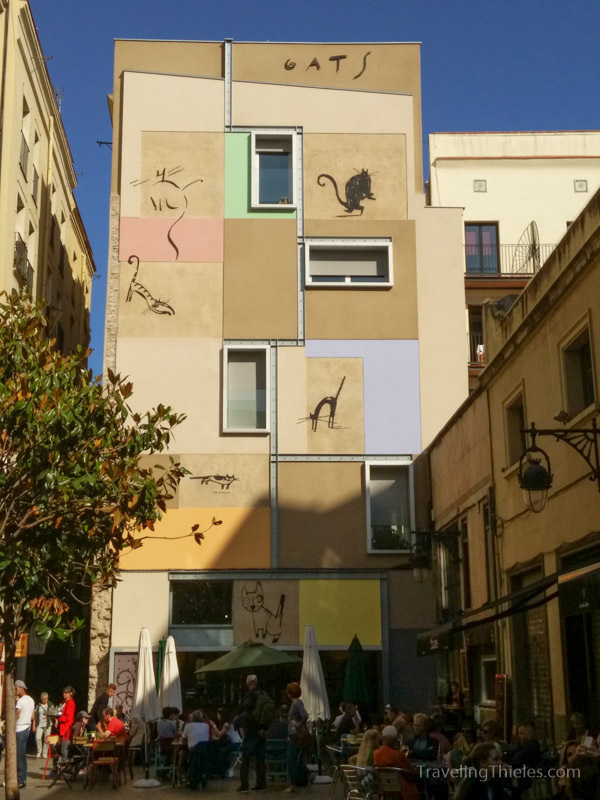 The outside of the building are slanted but fixed windows surrounding dead air space (for insulation?) and a second inner wall of multi-colored steel panels. 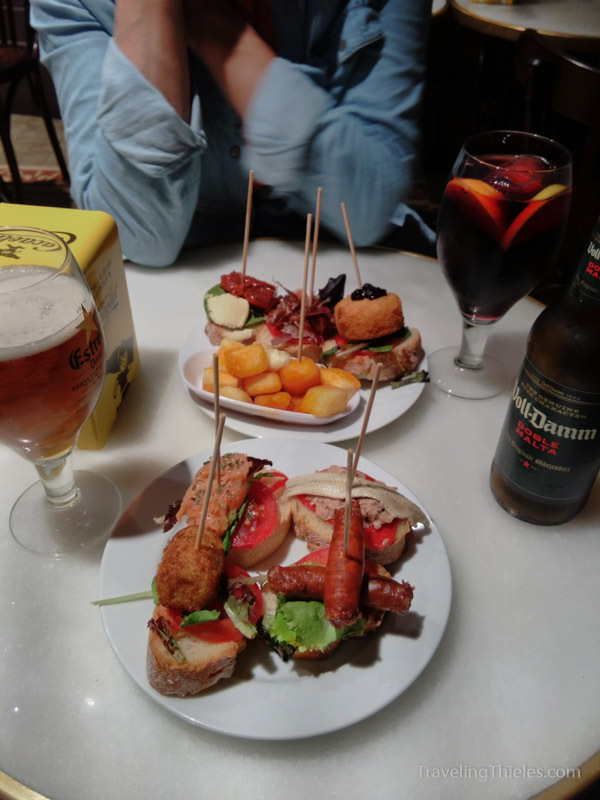 We had some tapas at a restaurant near las ramblas. Turns out it was a little too touristy and the food wasn’t that great. I do like the Voll-Damm beer though (the double malt version of the Estrella Damm, which is kinda like a Budweiser equivalent). 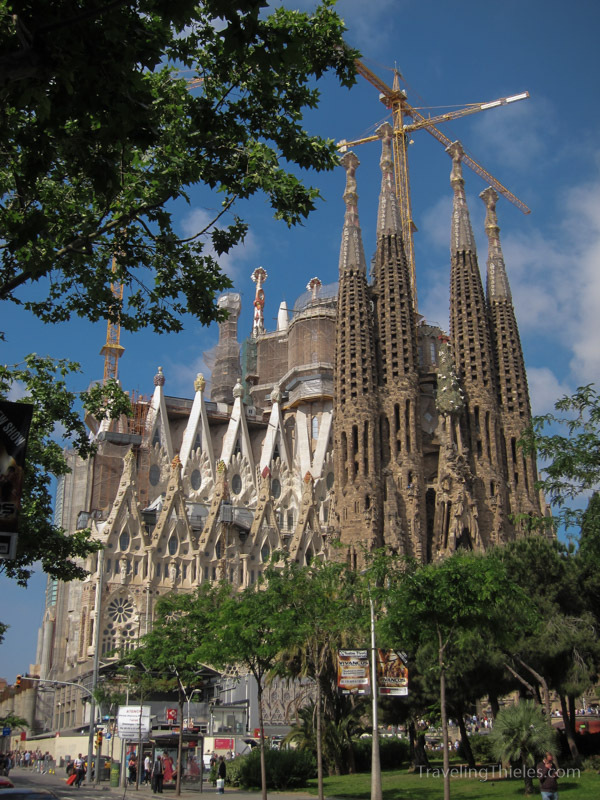 A ton of progress has been made on the Sagrada Familia basilica since I was in Barcelona last. 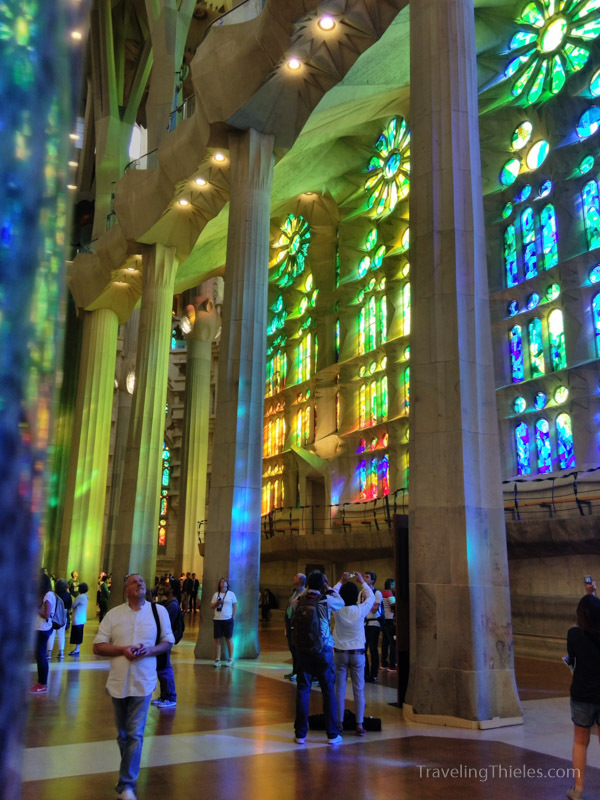 The main thing left is the center apse. 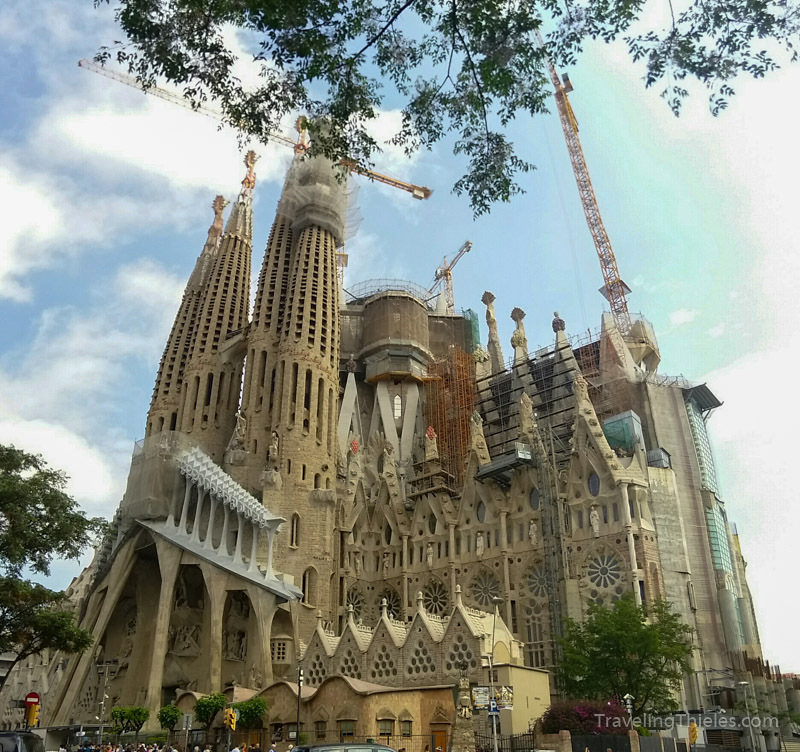 Here you can see the other side of the Sagrada Familia. 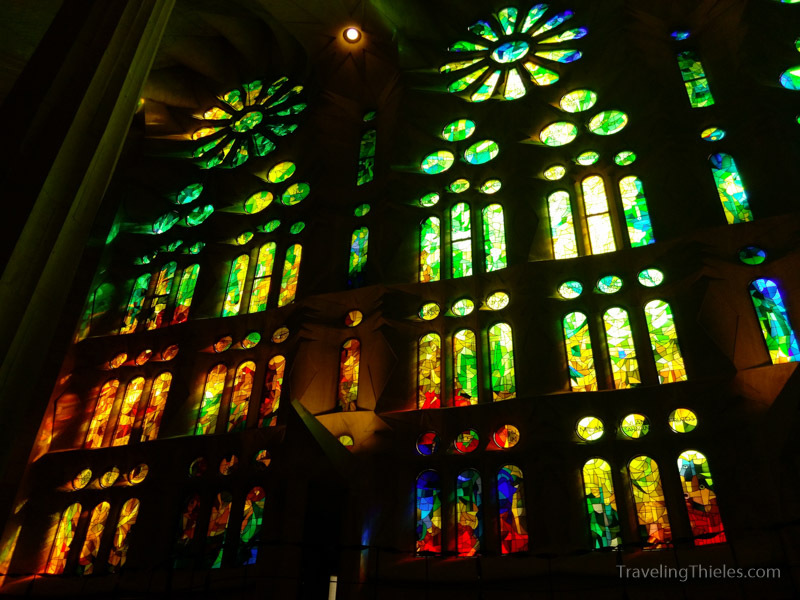 The stained-glass windows in the Sagrada Familia are now in and in our book are the prettiest windows that we have seen anywhere in the world. 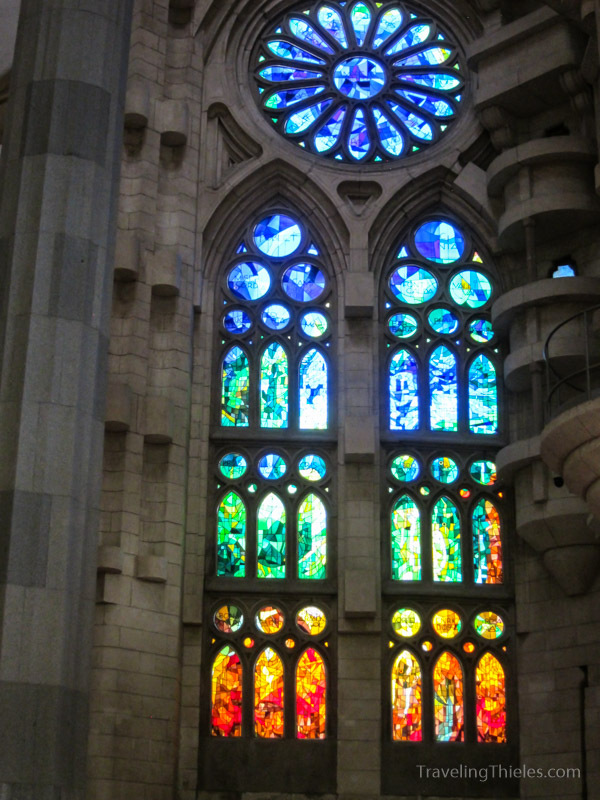 They are all abstract with a rainbow of colors in panels which generally move from warmer to cooler colors. 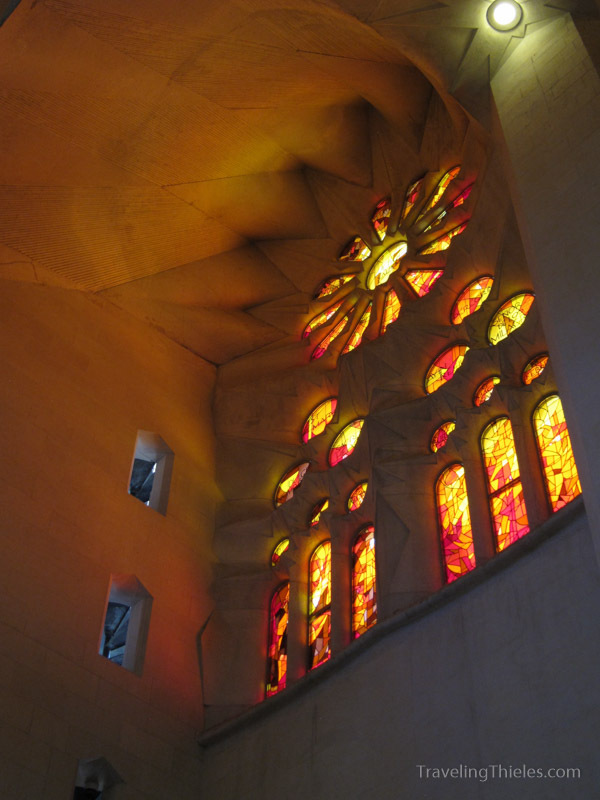 More views of the stained glass windows. 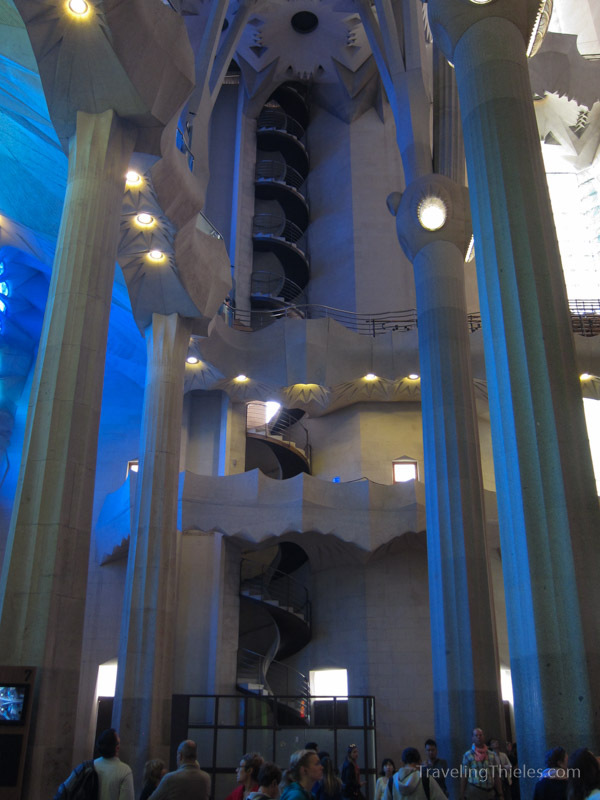 The inside staircases in the cathedral which lead to the choir balconies and parts further up are tight cork-screws of steps. Very dramatic. 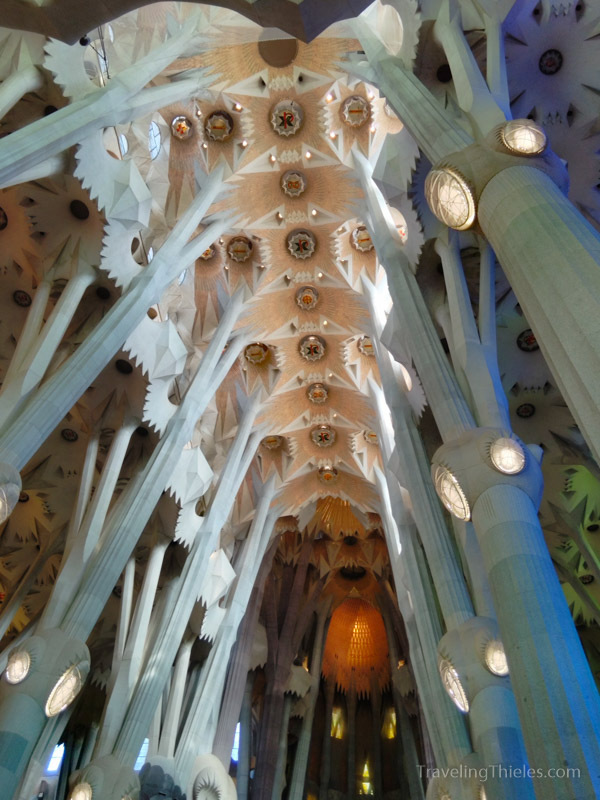 The ceiling of the Sagrada reminds one of a forest of trees with light peaking through the canopy. 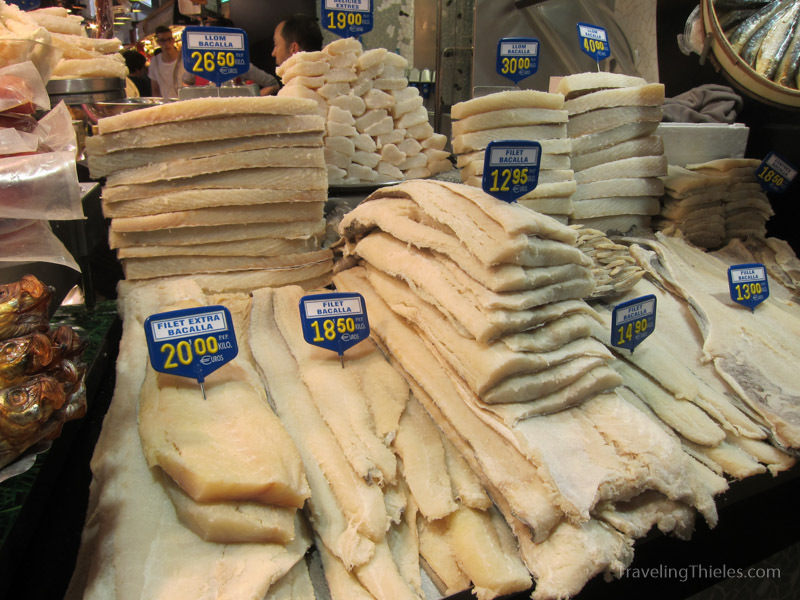 Mayne loves the bacalao or salted cod that the Spainards love to fry up and mix into croquettes. It is very affordable too. 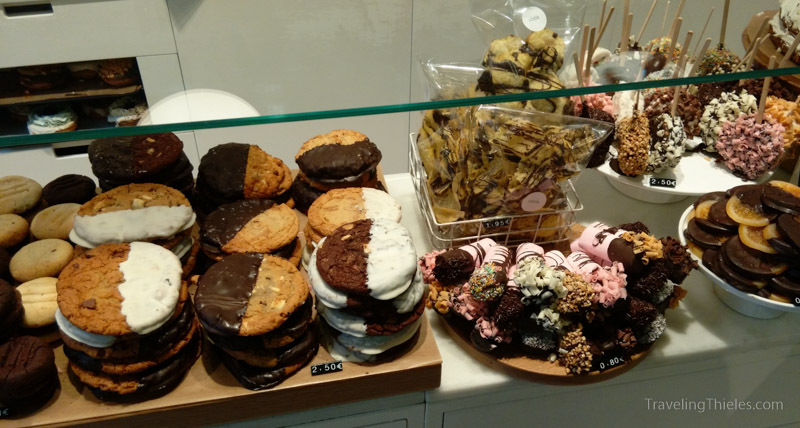 Elisa spotted this fancy bakery shop on a side street from the Boqueria market. 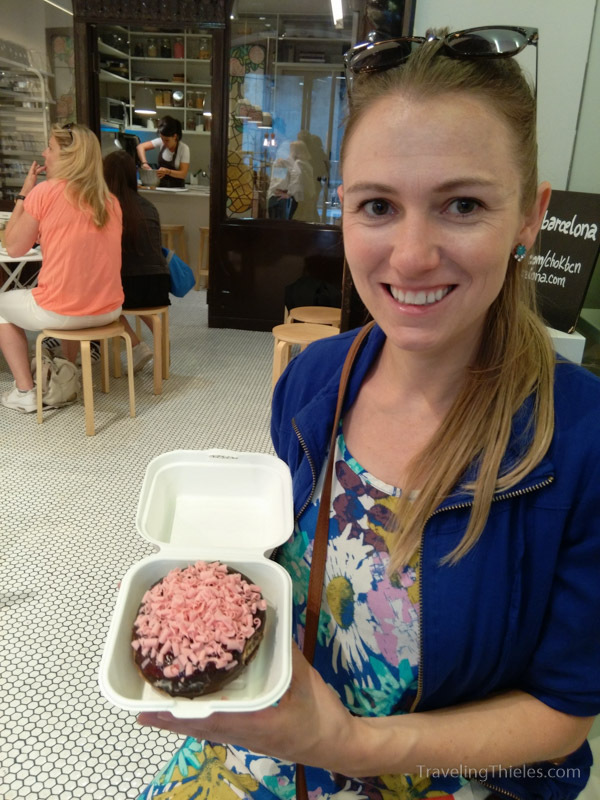 It was decent and had some very picture-perfect sweet treats. 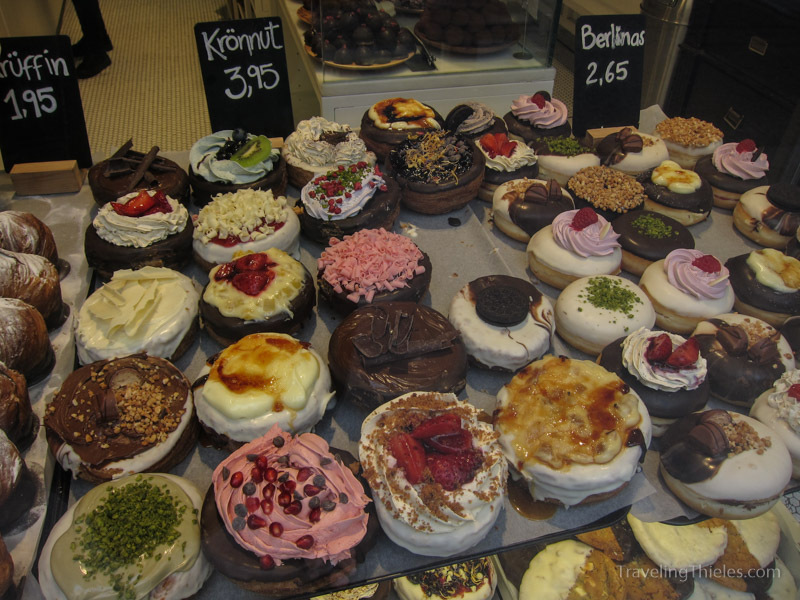 We made several trips to the markets in Barcelona for snacks. 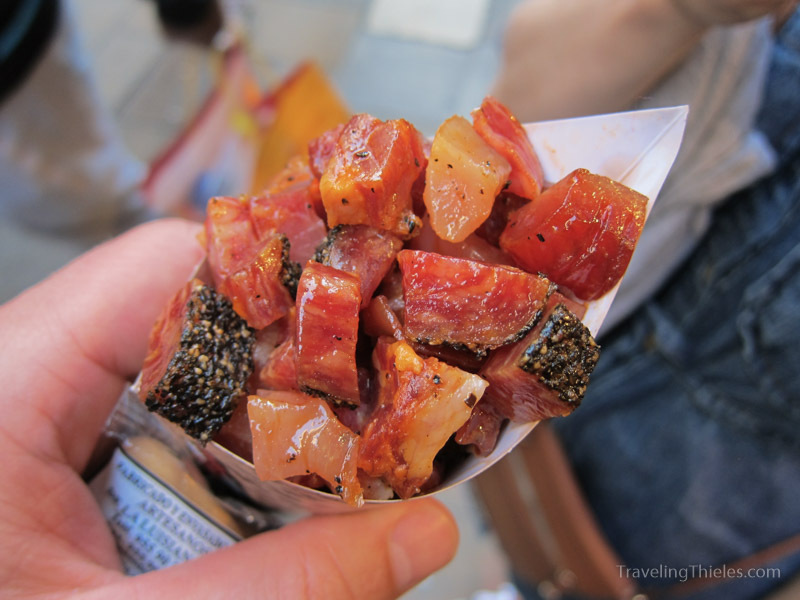 The Boqueria market is probably our favorite despite being super crowded with other tourists. 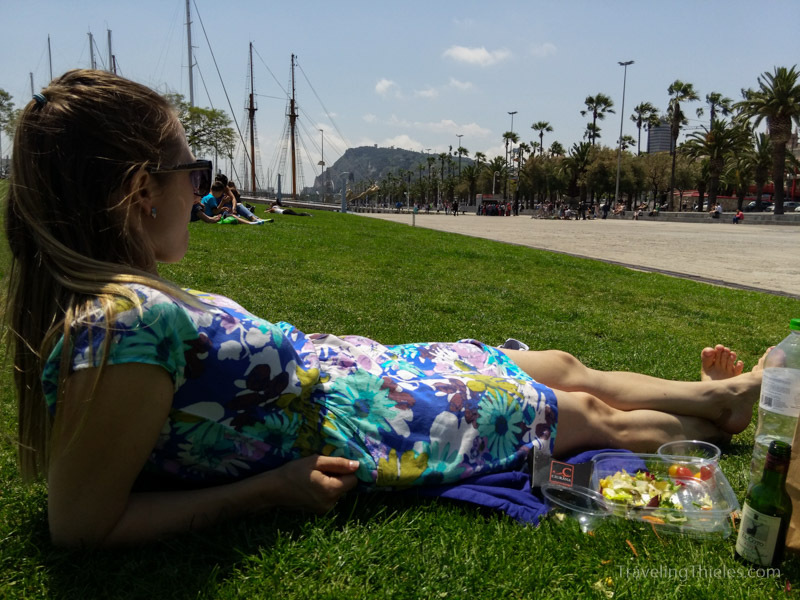 We mostly came for the ham, cheese and fruit juices and not the seafood though..
We spent a ton of time walking through the city which was more or less by design. 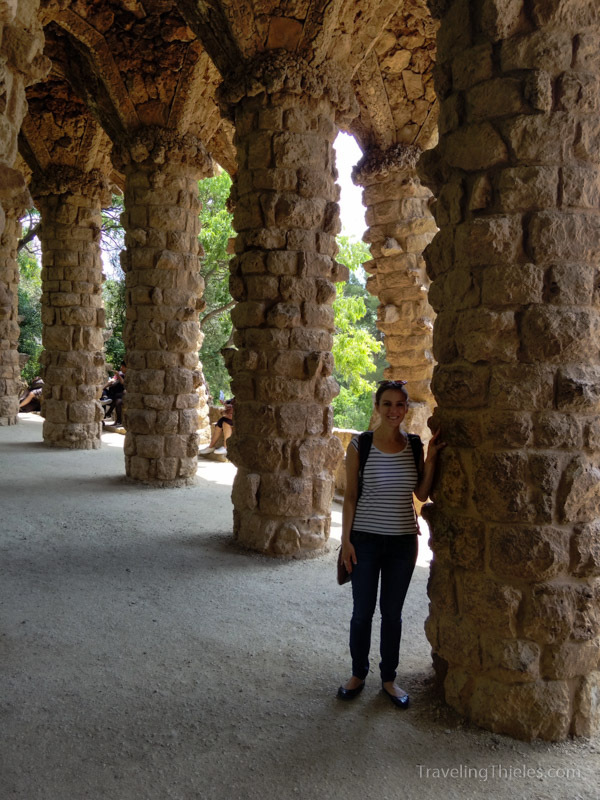 However, with lingering jet lag and frequent meals of jam, wine and pastries, it was nice to kick back and relax every so often. 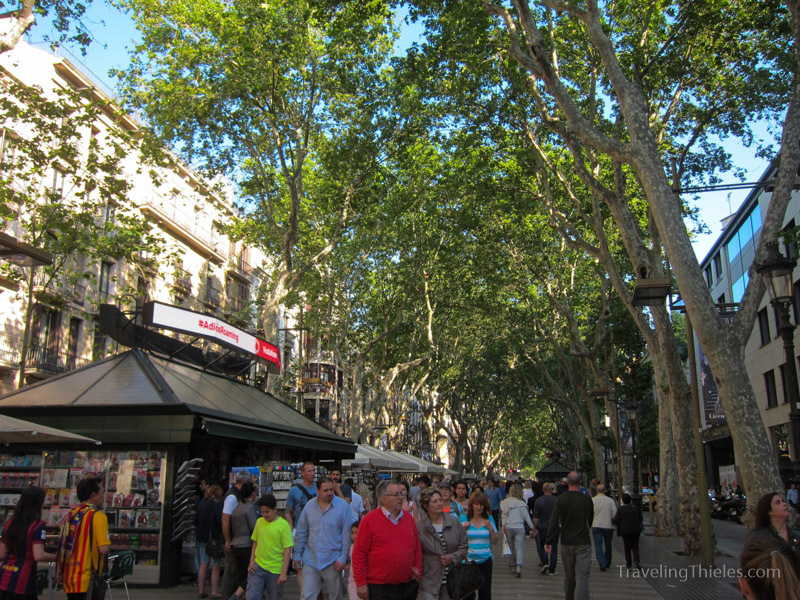 Here we are at the waterfront at the end of La Rambla de Catalunya. The weather and people watching was fantastic. It was starting to be the season of the big boats coming to visit in Barcelona – here is just a sampling of the yachts..
View of one of the beaches on the east side of the city just outside the Barceloneta area. It was quiet when we visited on the weekday but this same beach was stacked to the gills with sun-worshippers when we came back on the Saturday. 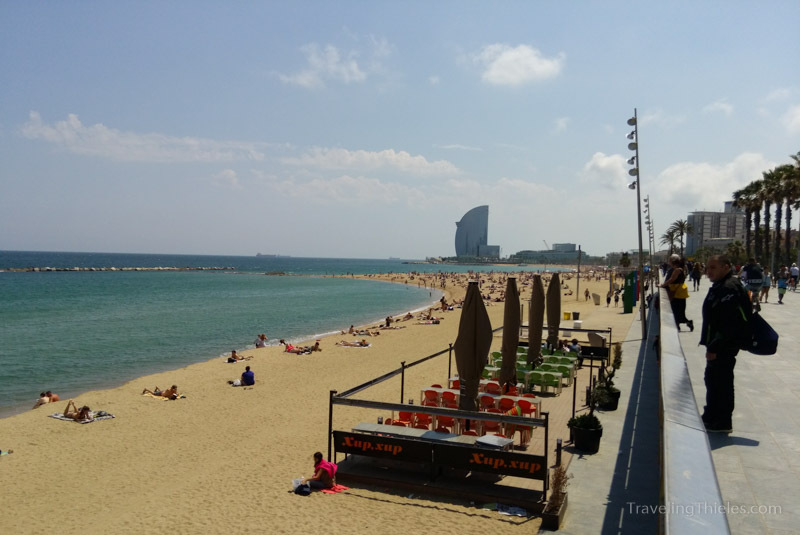 Personally, I am not a big fan of the crowded Barcelona beaches (which are mostly man-made dating back to the 1996 Olympic games). 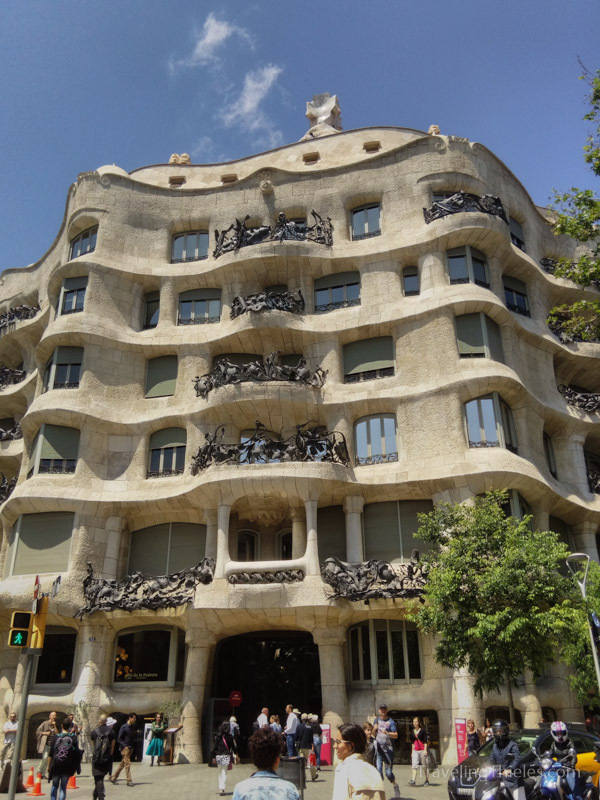 La Pedrera designed by Gaudi which we didn’t go in because it would have cost us close to $60. We did admire it from the street though and flipped though some postcards showing the insides! 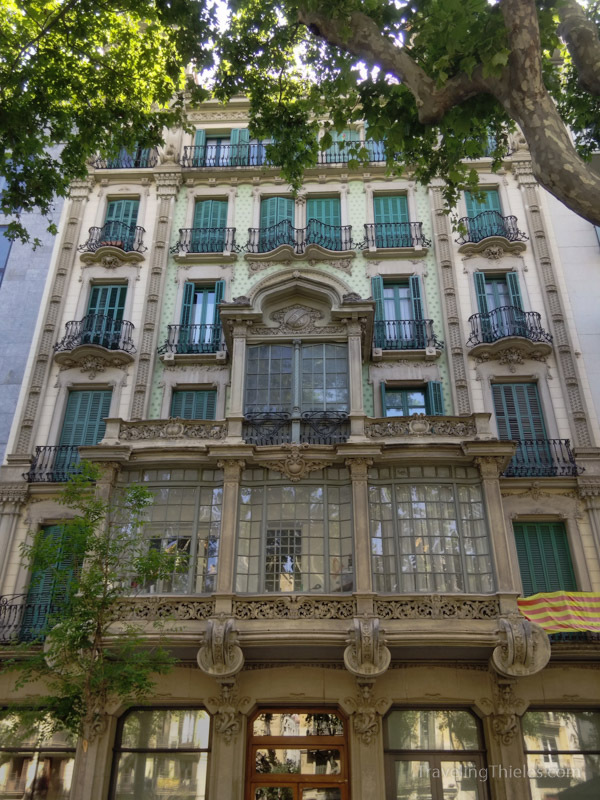 Another neat modernisme style building in Barcelona. This one was right next to the comic book shop and a board game store (which was really neat). 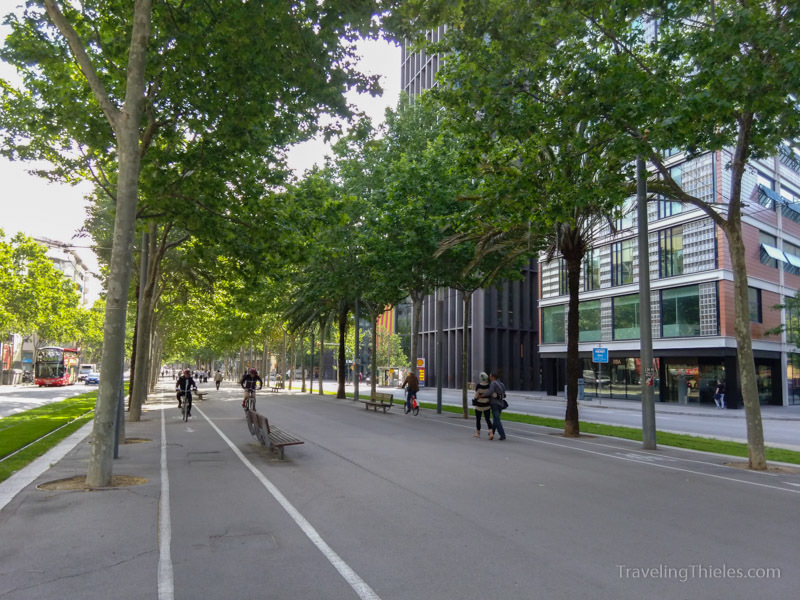 This was the relatively new rambla on Diagonal, which we walked every morning and evening to/from the metro and our hotel. 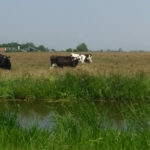 It was great for strolling. Spain seems to be ahead of the times even for Europe in some cases. We got tired of coffee and pastries for breakfast and went to McDonalds for egg and cheese sandwiches. 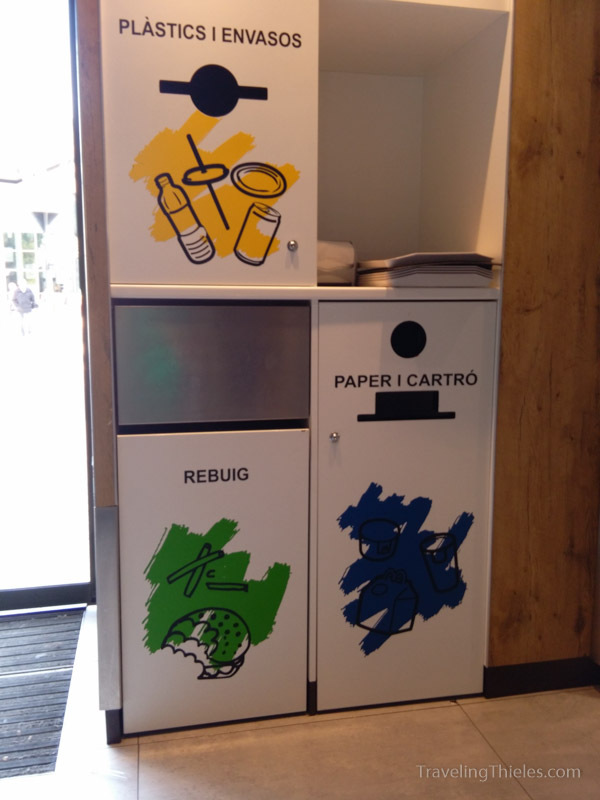 We were delighted to find inside separate waste containers for all the recyclables. Btw – McDonalds’ breakfasts in Spain as well as their coffees are much better than in the states. 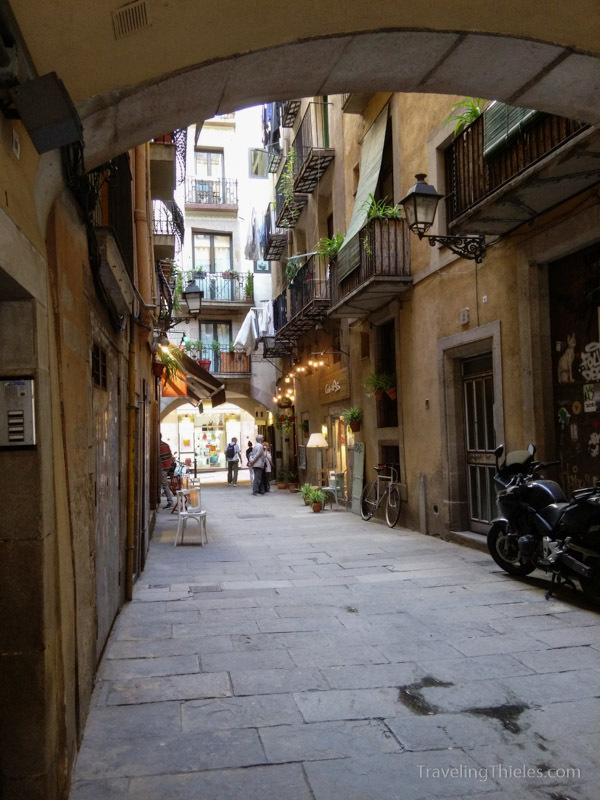 We particularly enjoyed wandering the old latin quarter of the city, including all the narrow passageways and small courtyards like this one. 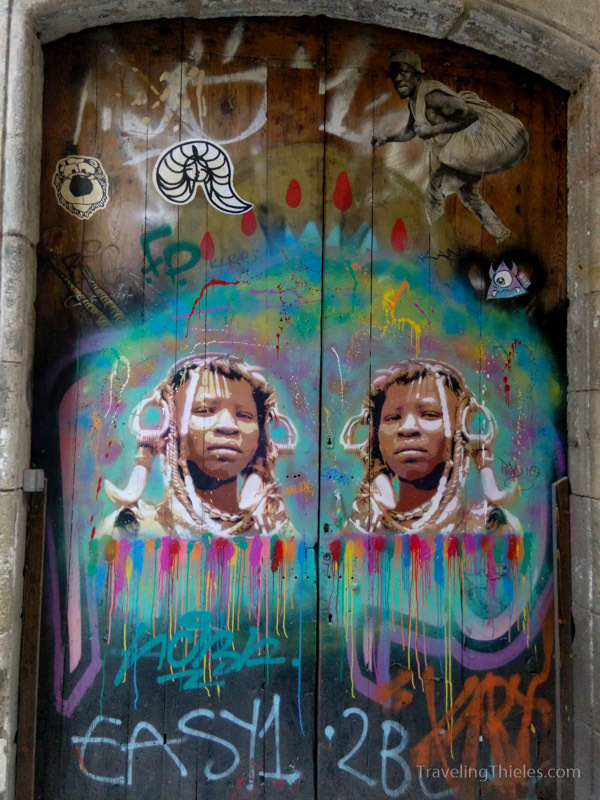 Like any good city, Barcelona has its share of great graffiti. 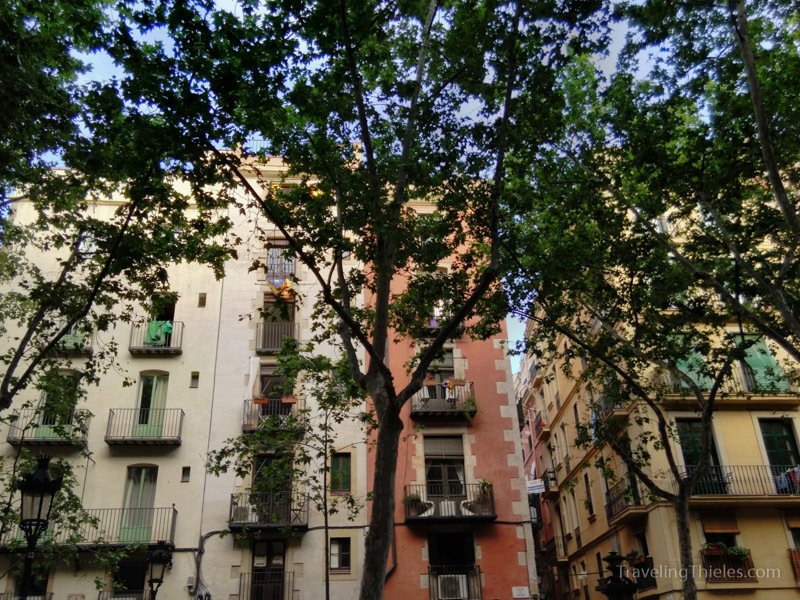 One of our favorite areas for affordable and delicious food and mixing with the locals is the Poble Nou area of the latin quarter. 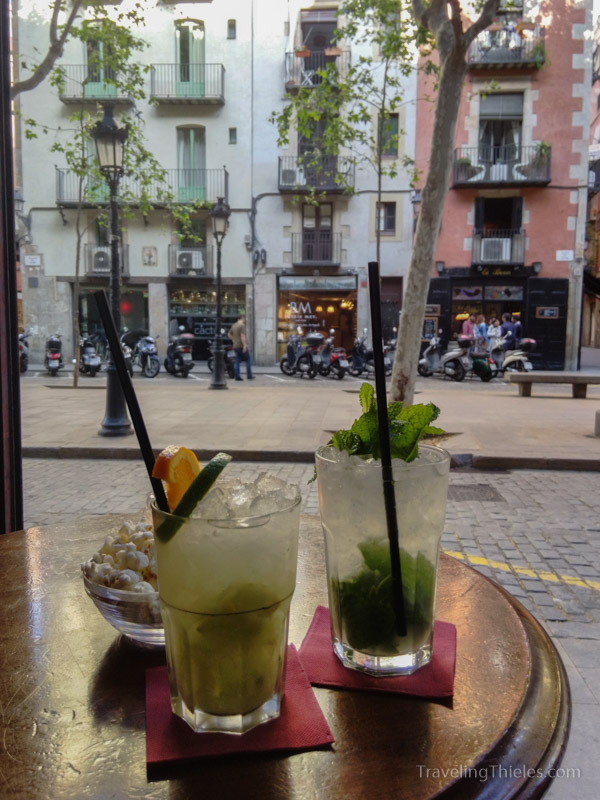 Mayne found his favorite cafe in Poble Nou – El Copetin – still here 10 years later! We had some excellent caipirinhas, mojitos and pisco sours. 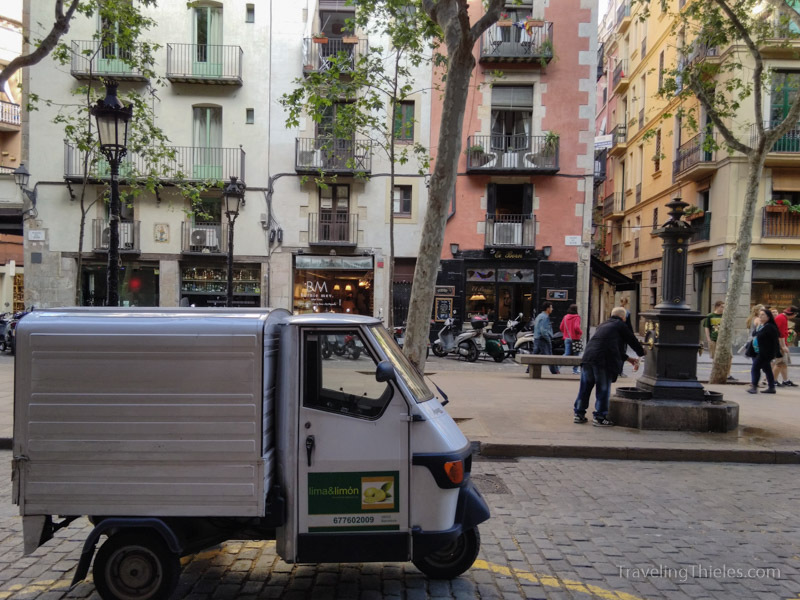 This cute little truck drove up while we were enjoying our drinks to deliver lemons and limes. 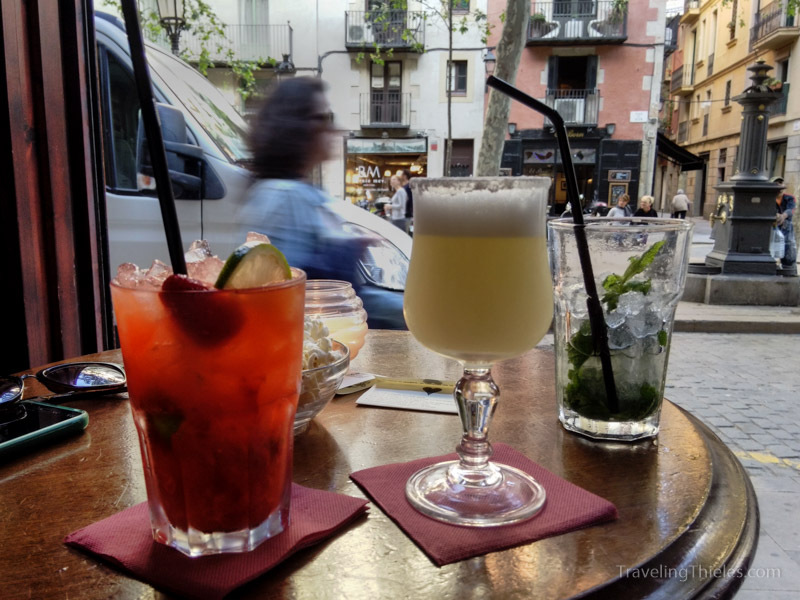 Round two – strawberry mojito and pisco sour. 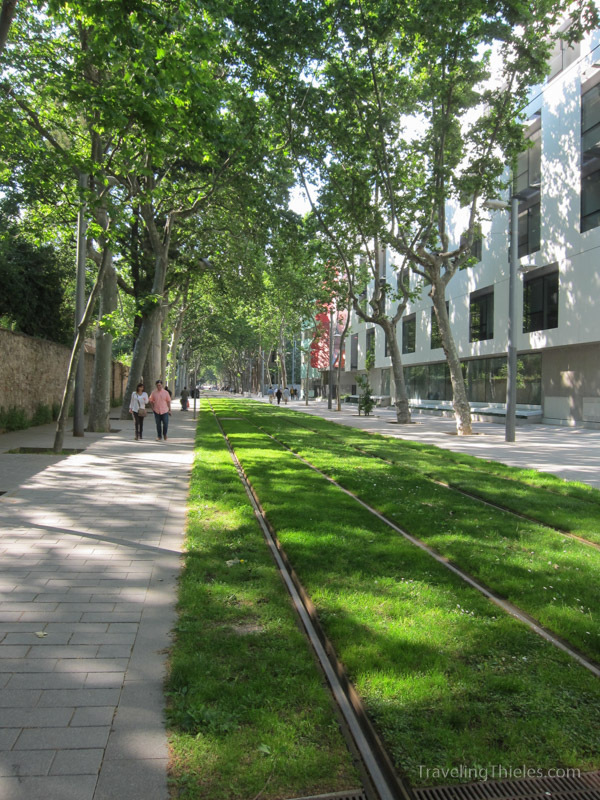 Rambla de Poble Nou street. 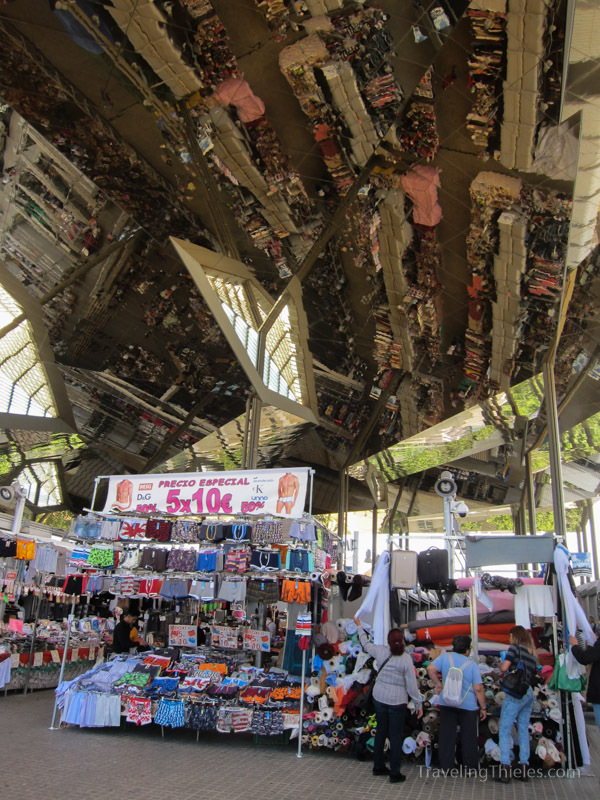 The flea market near Plaza de Glories Catalanes has a new (to me) home under this giant mirrored roof. 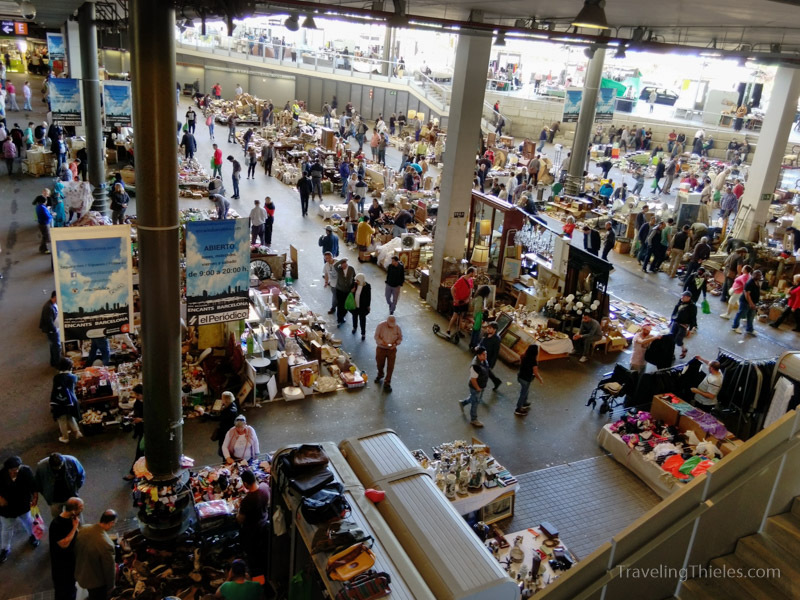 View looking down at the flea market. There was a lot of junk and cheap asian stuff but we did find some neat books from the late 19th/early 20th century. 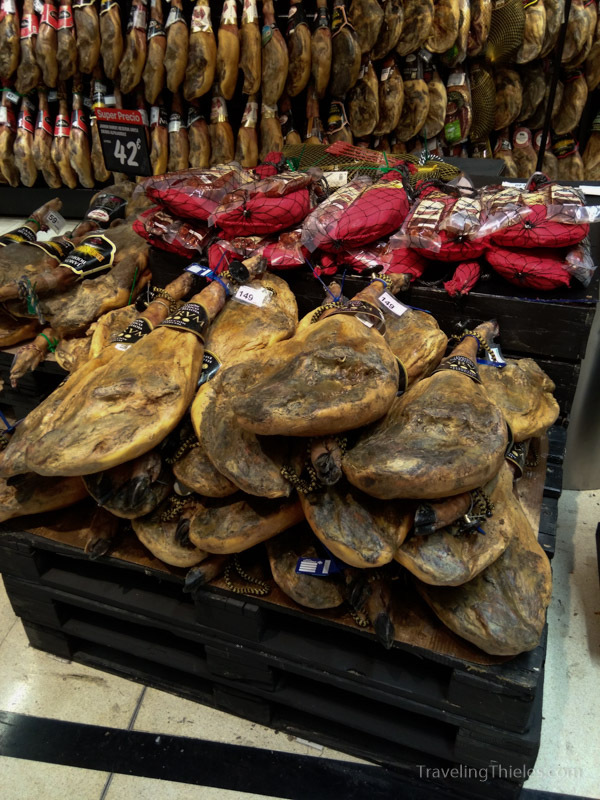 One was full of maps and architectural drawings of Spain but was too big for a souvenir..
Ham legs in the carrefour supermarket. The Spanish truly are crazy for their ham. 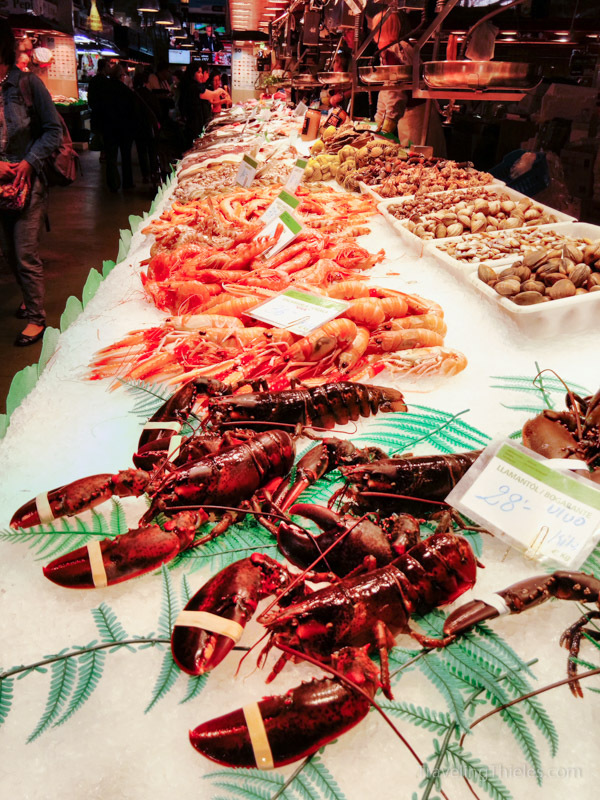 Mixed seafood in the Barcelona area. 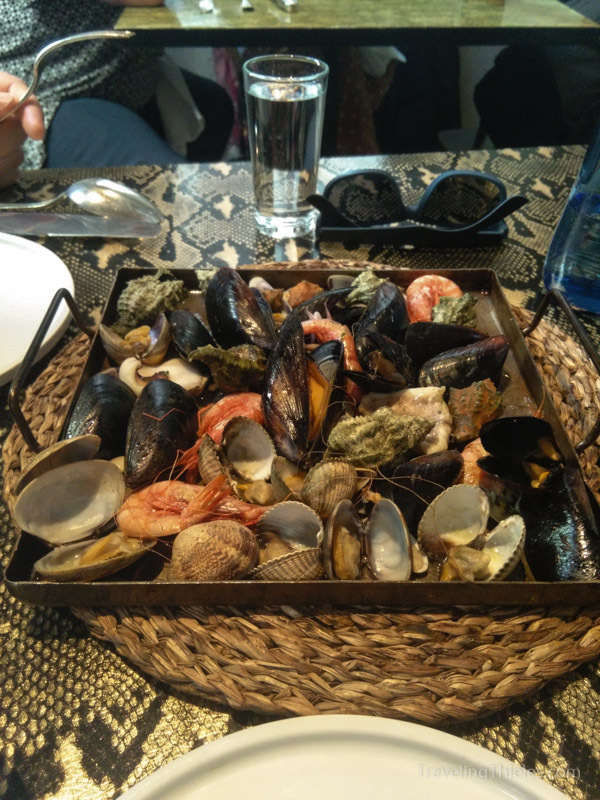 The restaurant came highly-recommended and while the variety was interesting (lots of snails, some sweet-tasting shrimp and odd clams) it wasn’t something we would get again. 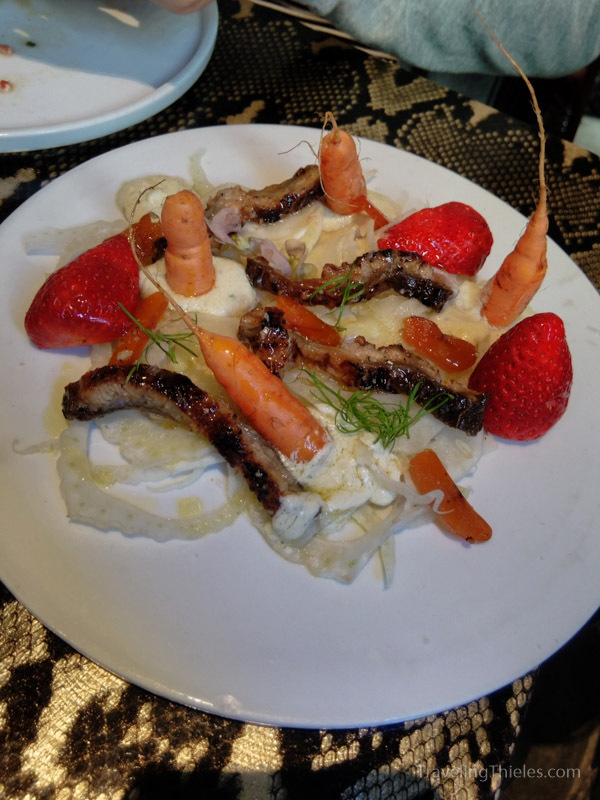 Interesting dish with eel and radish.